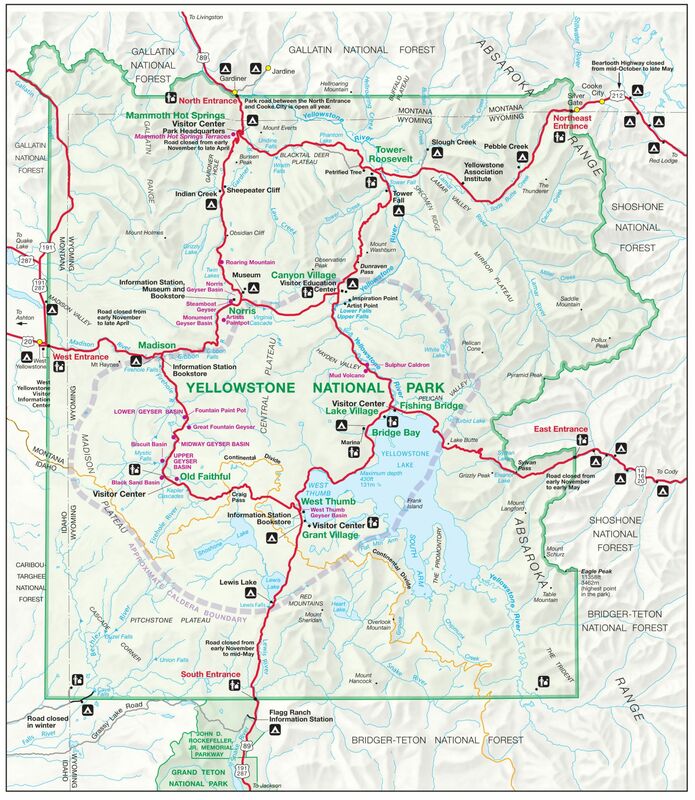 We had spent the previous day visiting the eastern portion of Yellowstone, the logical area to see first since we had arrived from that direction. 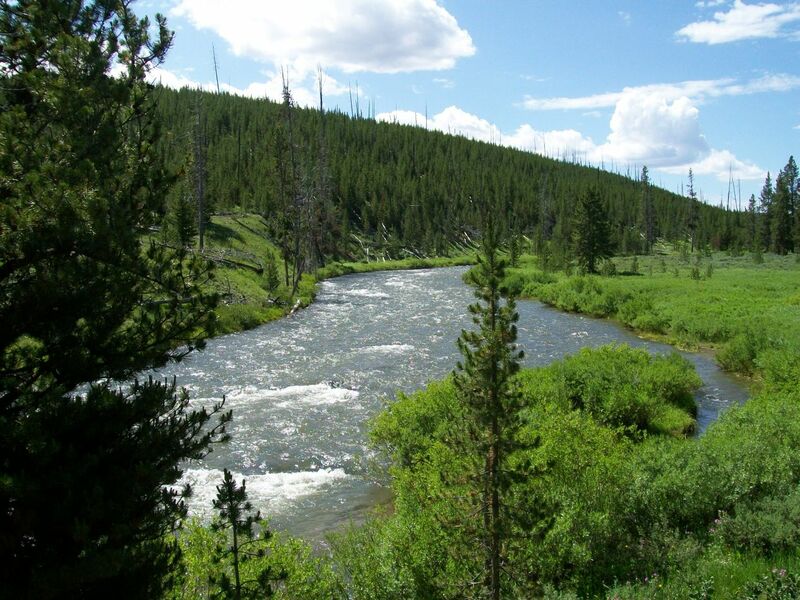 On this second day in the park we would be focusing on the northern sections of Yellowstone. They often tend to be a bit less crowded because the main entrances to the park are located in the east and west, especially the popular western entrance. 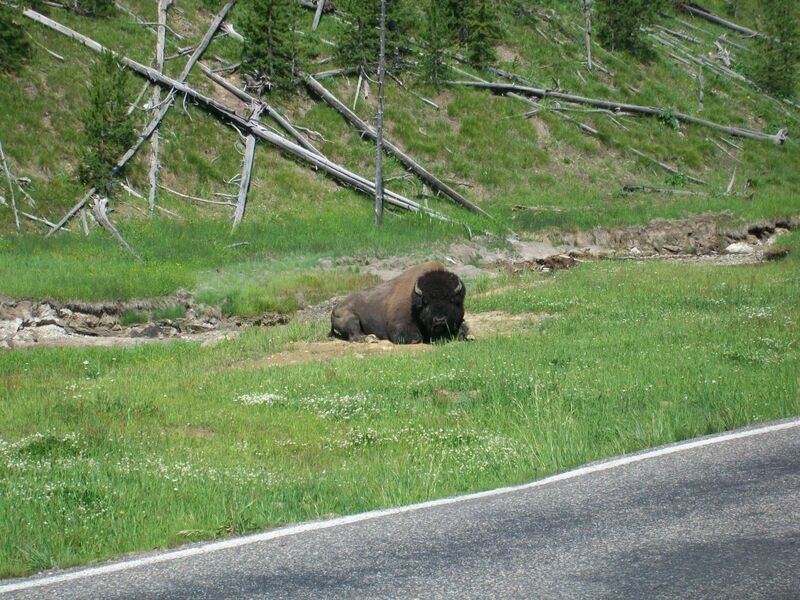 While driving into the park from our hotel in West Yellowstone, we spotted more wildlife along the side of the road. There were more deer of some kind grazing on the grasses in a herd, and then later we saw a male bison by himself laying in the dirt. He was watching the cars pass by with a lazy expression on his face, knowing full well that the cars were there and not choosing to do anything about them. As I mentioned before, these casual meetings with the big animals are one of the best parts of visiting the park. 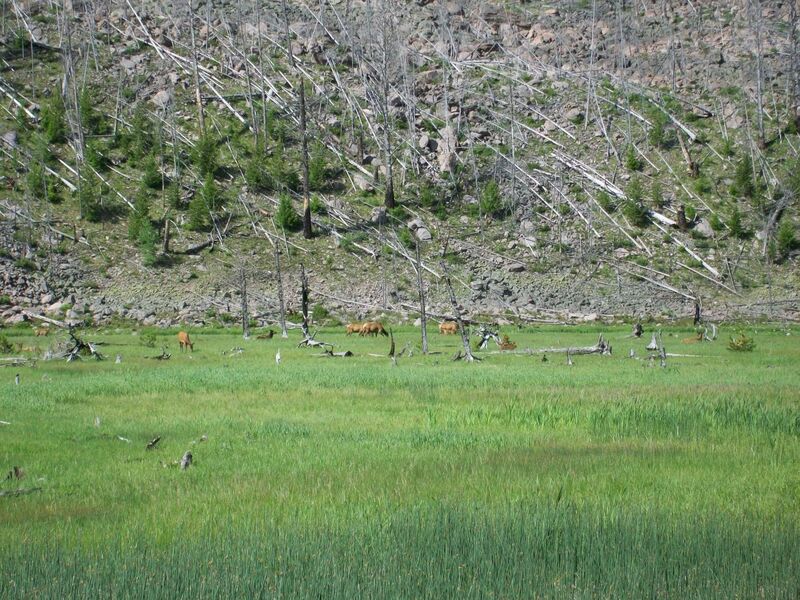 This time we turned north when we reached Norris Basin and headed into a new part of the park grounds. 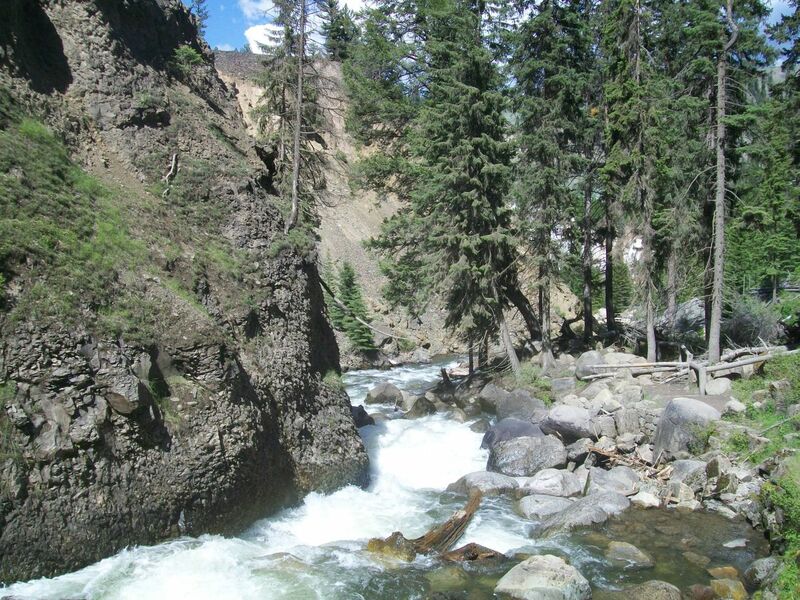 There was a short hiking trail located here at the place known as Sheepeater Cliff, and we stopped for about an hour to walk the gentle path that ran alongside the river. 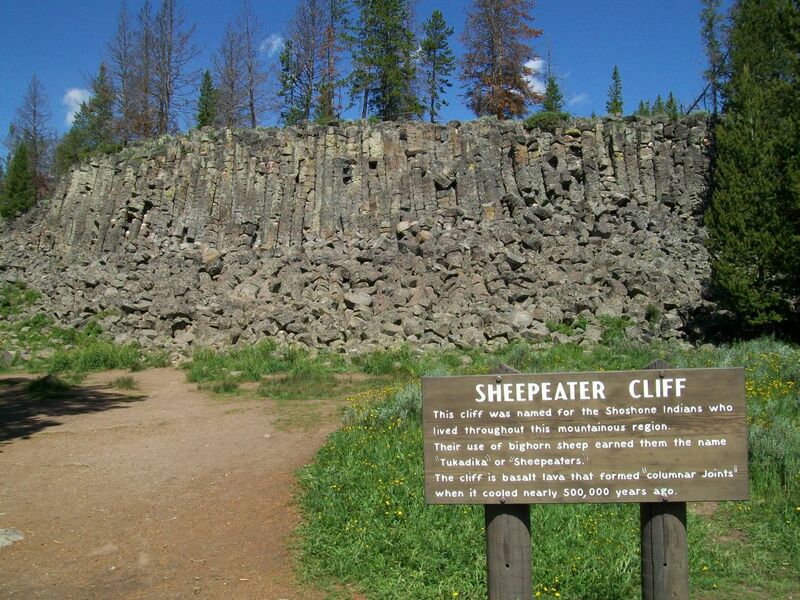 The "Sheepeater" name came from Shoshone Native Americans, who lived in the region and ate some of the bighorn sheep that roamed the hills. What the sign above does not mention is that there was a brief conflict between the Sheepeaters and the US Army in 1879 in nearby Idaho that ended with the subjugation of the Native Americans. They had wanted to keep using this land for hunting while the army wanted to keep them out to protect the tourists coming to the area. Leaving aside that sad history, the walking path here made for an easy stroll and the forested land was charming. We were enjoying great weather and it was a wonderful day to be outside on a short hike. I would recommend this trail to anyone passing through who wanted to stretch their legs for a short while. 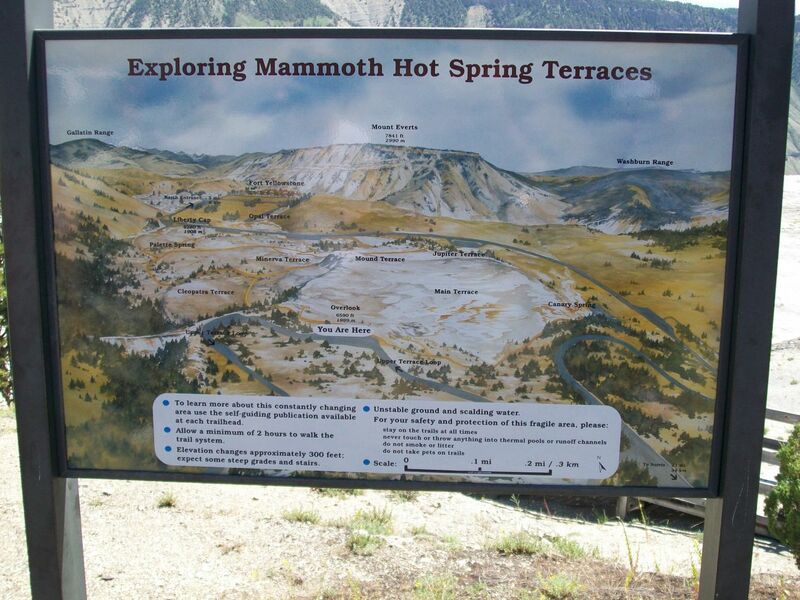 Our main destination for the morning was located further to the north, at the area known as Mammoth Hot Springs. 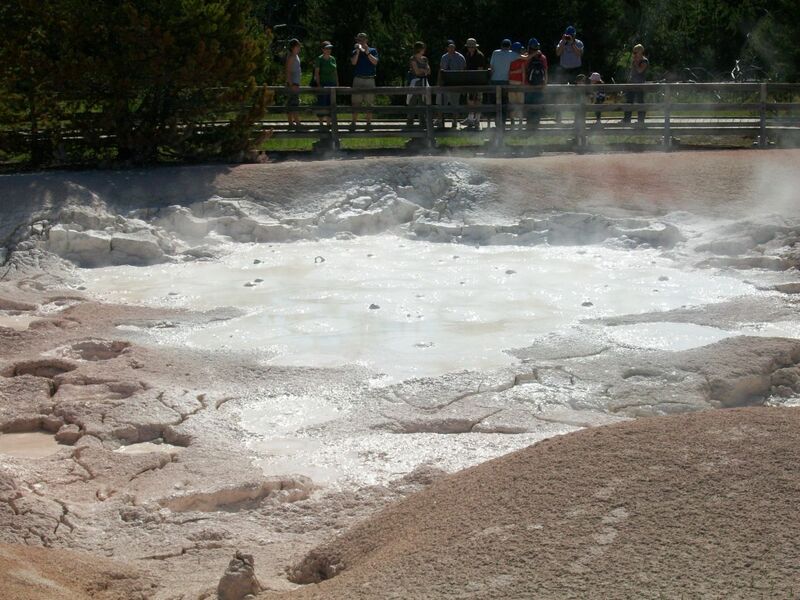 This is a large collection of hot springs located near the oldest collection of buildings in the park. 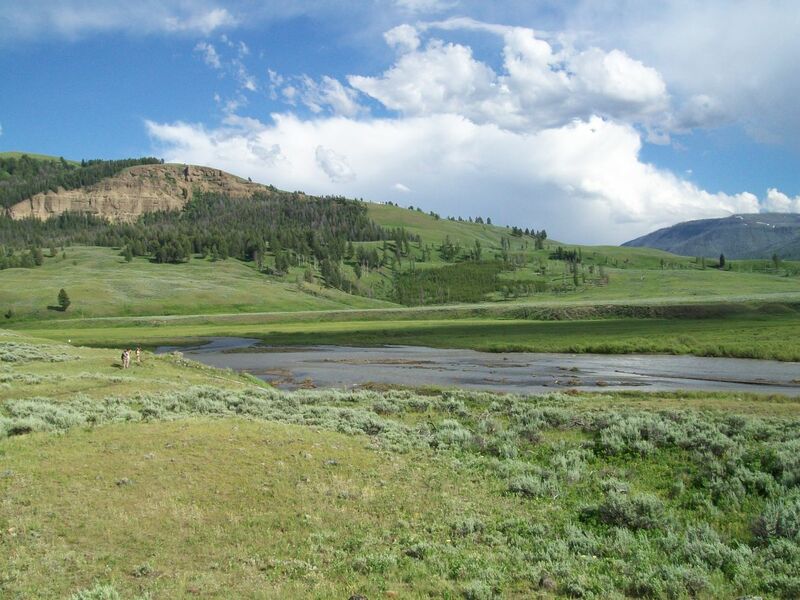 The US Army built Fort Yellowstone here in the late 19th century to ward off poachers who were trying to abuse the lands within the park, and the Yellowstone Park headquarters are still located here today. 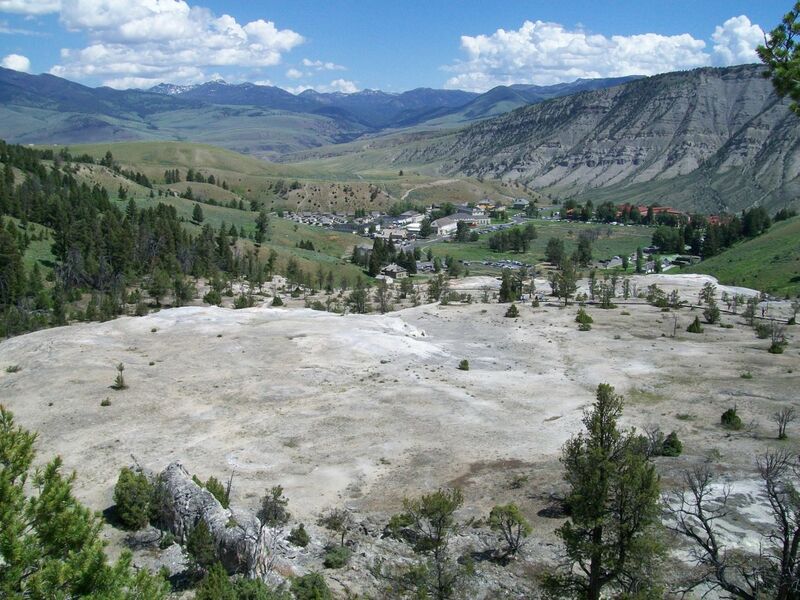 The main parking lot at Mammoth Hot Springs was situated on an elevated overlook, with walking trails leading down past the boiling waters to the small town at the foot of the hills. 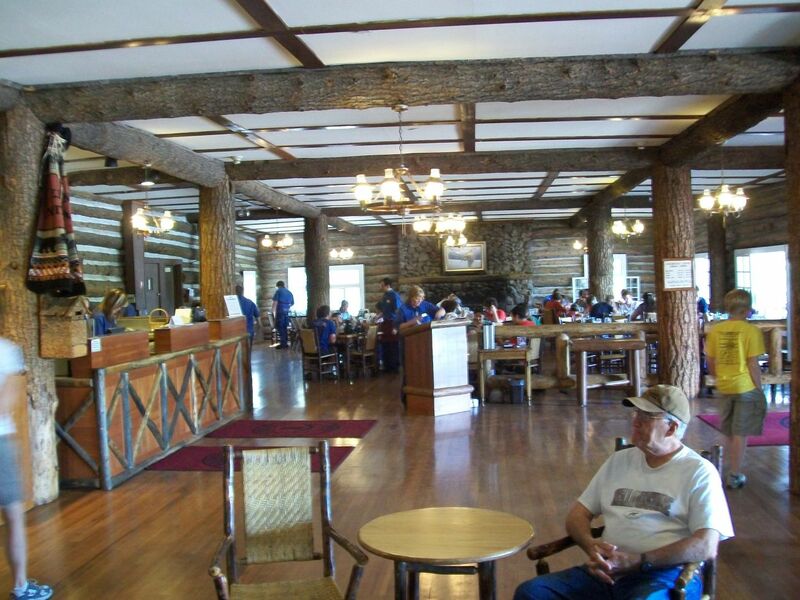 We decided that we would walk around and see the hot springs and then have lunch for the day in Fort Yellowstone. 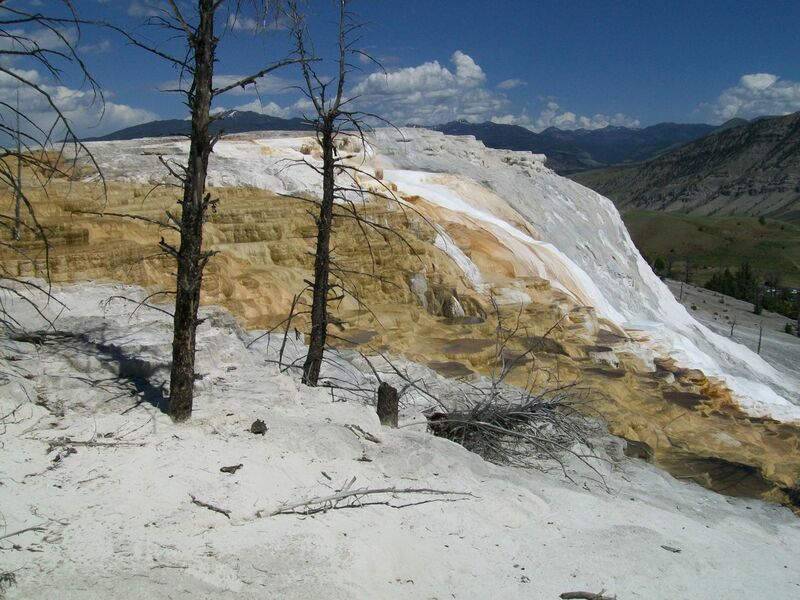 The geothermal pools of water that made up the Main Terrace of Mammoth Hot Springs were a sight to behold. 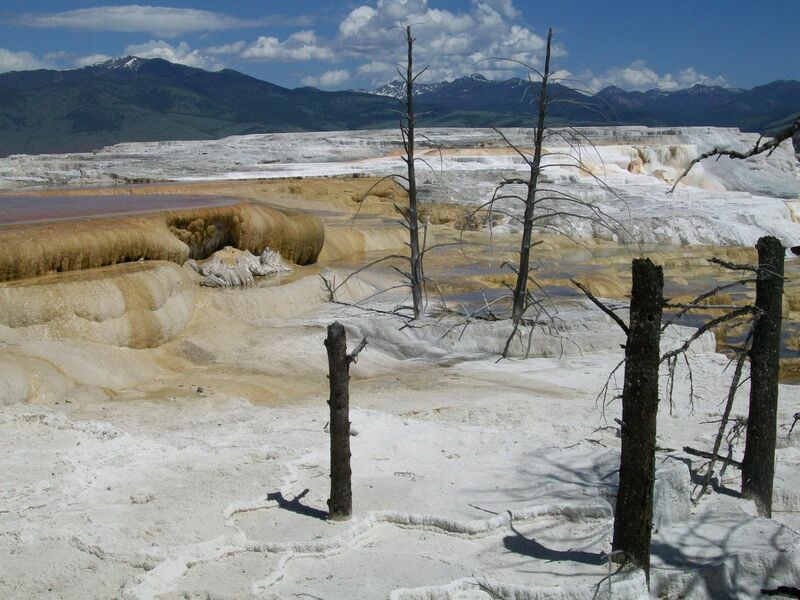 Thermal activity has been taking place here for thousands of years, allowing mineral deposits to accumulate and pile up in large mounds. The water that comes out of the ground is just shy of boiling temperature at about 170 degrees Fahrenheit (80 degrees Celsius). There are lots of signs here warning visitors not to stray off the paths or try touching the water due to the possibility of serious burns. You would not want to fall into this water, trust me. 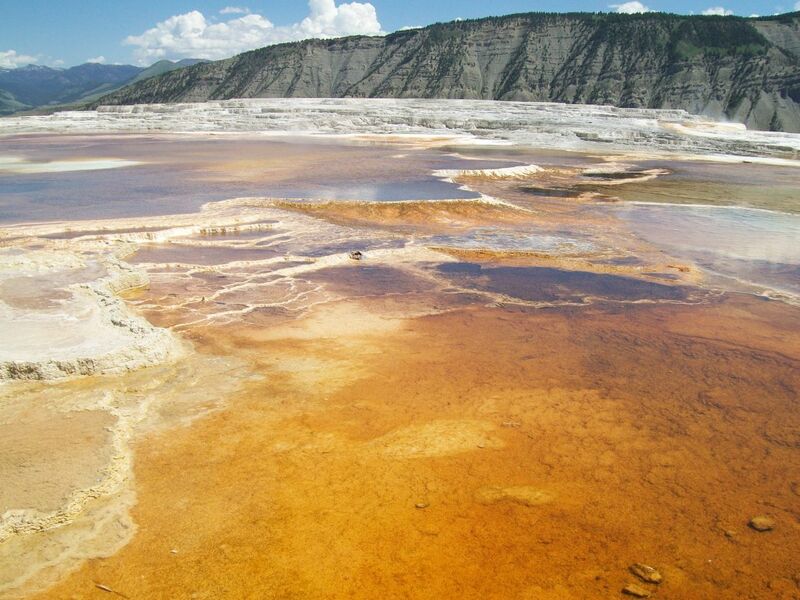 The color of the water was mostly an orangish-brown hue due to the algae that lives within and feeds off the minerals coming up out of the ground. 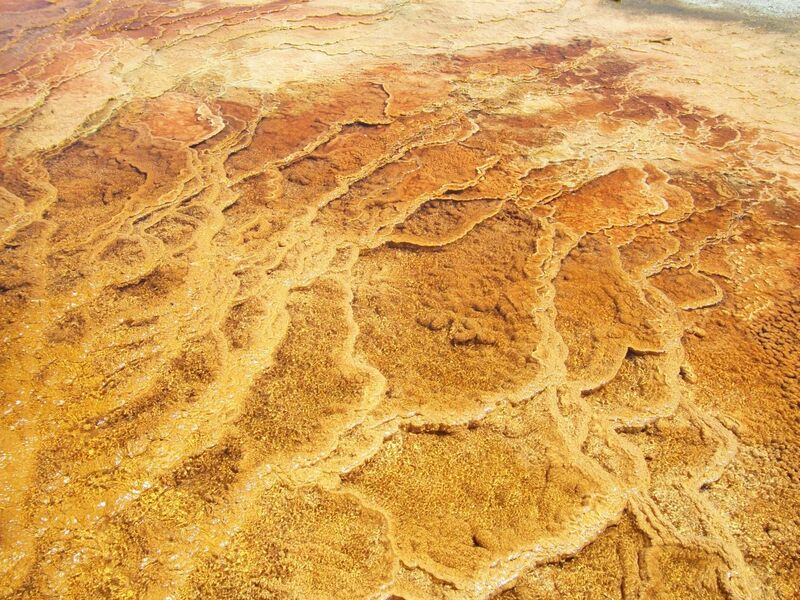 Where the water had dried up or shifted course over time, the ground had a white color due to the presence of calcium deposits left behind by the flowing water. The only trees in this area were dead and blasted things, looking like dried out husks. The landscape here was unsettling, looking a bit like a post-apocalyptic wasteland. 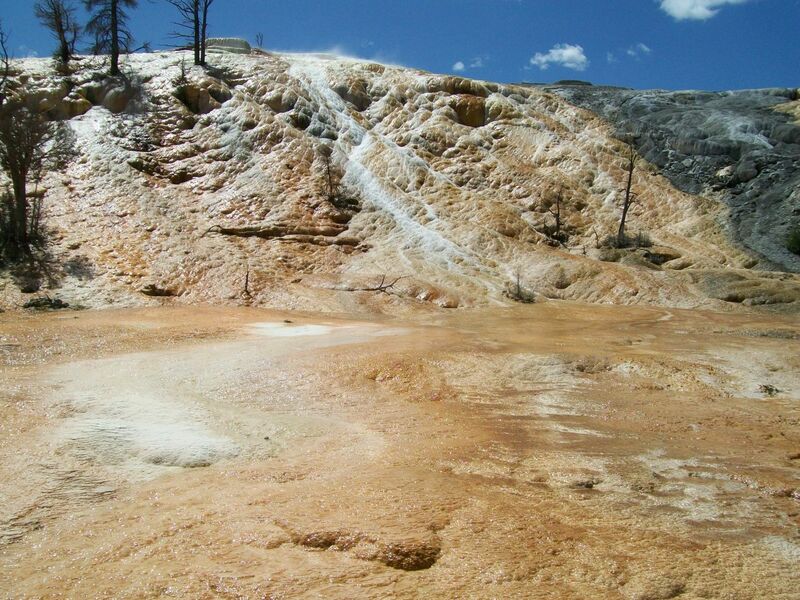 Where the hot spring water ran down the slopes in the ground, it left behind mineral deposits in the form of big, blobby humps. The flowing water therefore created a waterfall effect as it ran downhill, but a different sort of waterfall than anything I'd ever seen before. 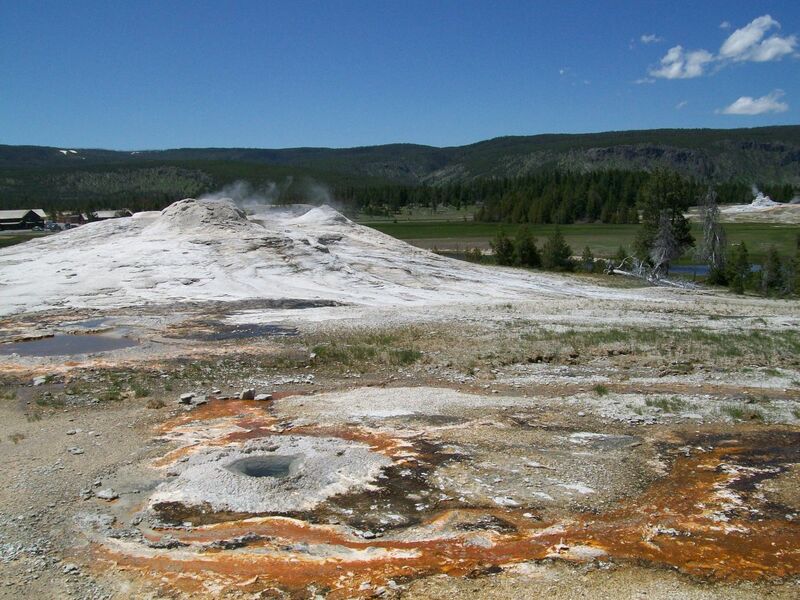 Steaming, boiling liquid fell across a series of orange and white mounds until it collected in pools at the bottom of the slope. Any living vegetation that the water touched appeared to shrivel up and die on contact, leaving only a wooden skeleton behind. It was completely unique and weirdly beautiful in its own way. At the same time, I had the feeling at times that I was looking at a vision of hell itself. This was not helped by the sulphuric stench in the air either. It was easy to see why superstitious earlier generations had associated these kind of places with evil spirits. We had lunch in Fort Yellowstone as planned at a place called the Terrace Grill and poked into a few of the shops afterwards to see some of the Yellowstone-themed merchandise on sale. Afterwards we hopped back into the rental car and began driving east again through the park. 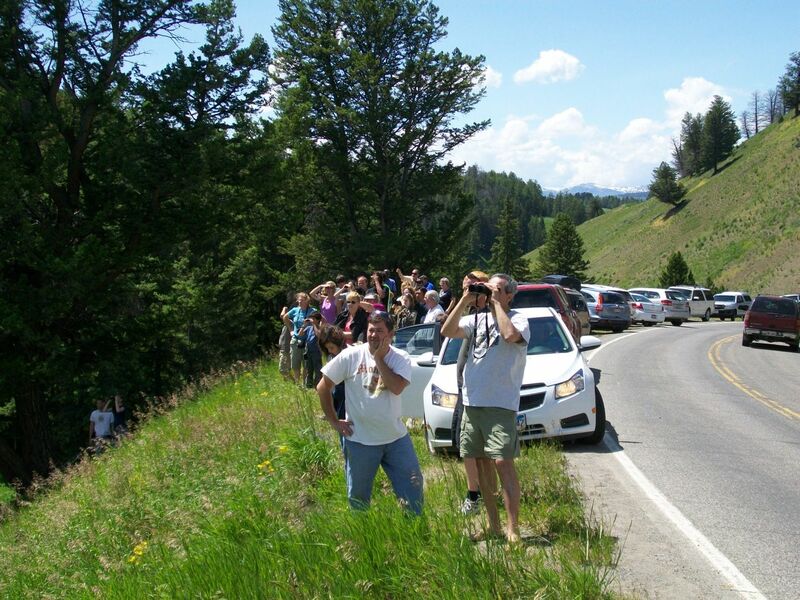 We soon came across a crowd of people stopped by the side of the road, which inevitably meant a wildlife sighting of some kind. 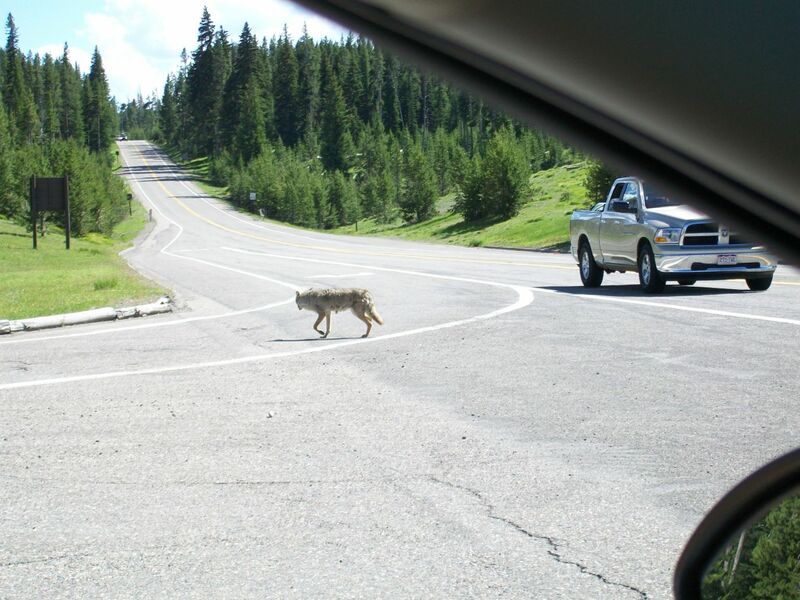 This is commonplace in Yellowstone and visitors can expect to see traffic jams appearing in weird places due to the movement of the animals. In this case it was a bear sighting that had everyone excited, with the animal located a good distance away off in the forest. 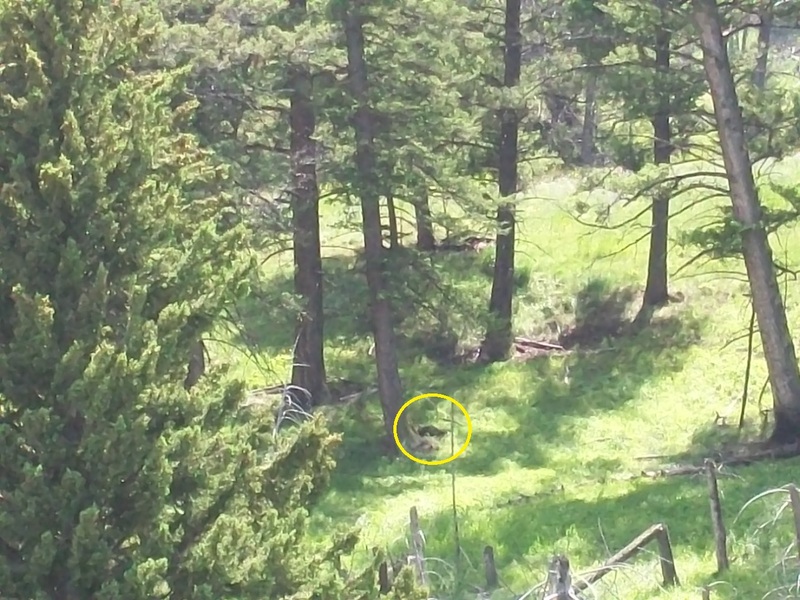 I zoomed in as far as this sad little camera could go and still didn't get a particularly good shot of the creature; I went ahead and circled the bear in the picture above. I had taken a much better picture of a bear in Cape Breton Highlands the previous year, and I would again get better pictures a few years later in the Canadian Rockies. This was not the most impressive wildlife sighting. 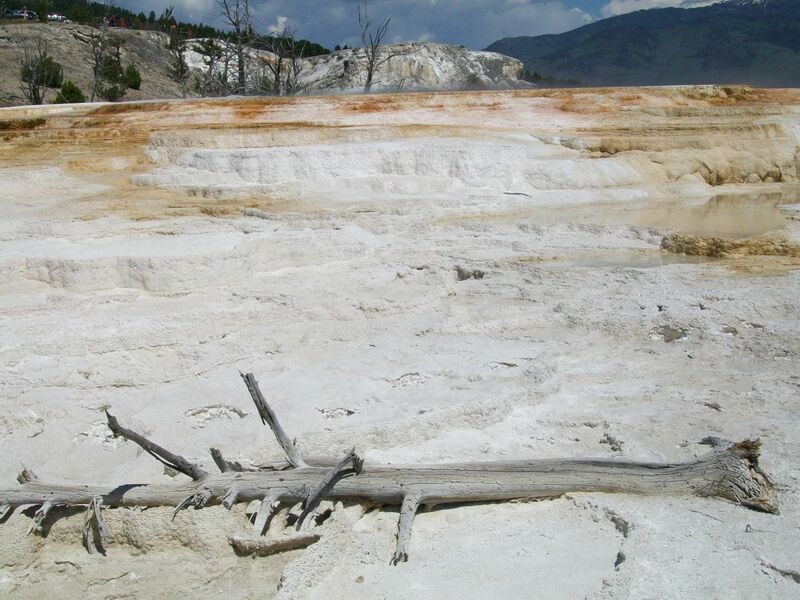 Near where we spotted the bear was another Yellowstone attraction known as the Petrified Tree. This tree had been mentioned in the informational brochures about the park, and we figured that we might as well stop to take a look while we were in the area. 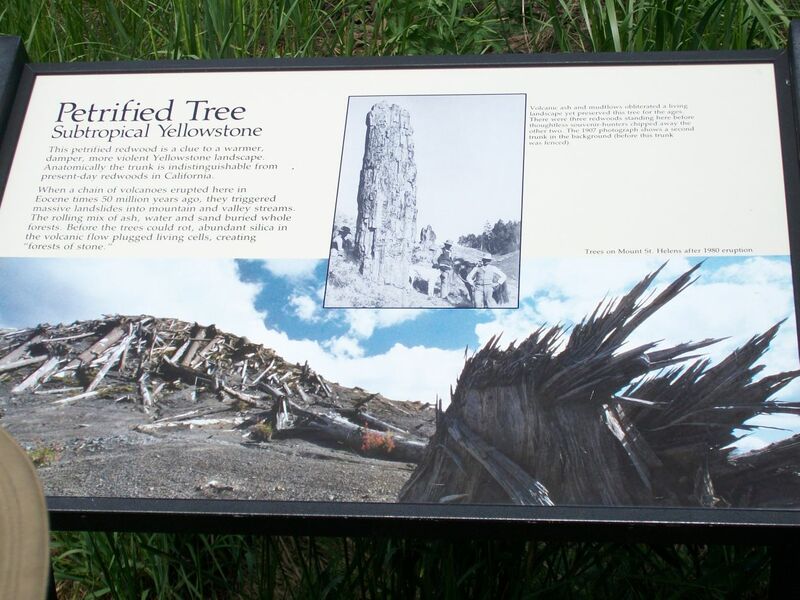 The Petrified Tree was pretty much exactly what its name suggested, an ancient tree that had been turned to stone after being buried under volcanic ash. 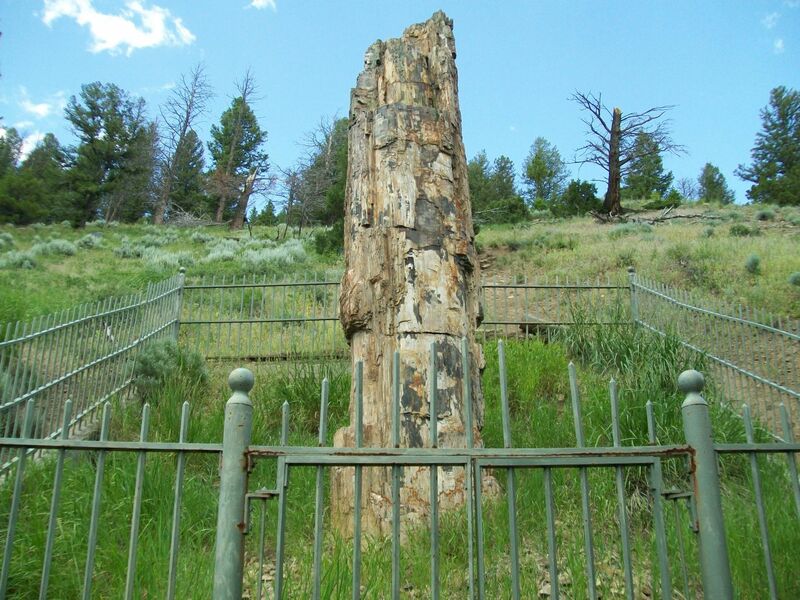 The fact that this was the petrified remnant of a redwood tree was kind of interesting, as Yellowstone's climate is far too cold to accomodate redwood trees today and this demonstrated how the climate had been warmer millions of years in the past. However, for the most part we found the Petrified Tree to be pretty underwhelming. It was basically a tree stump inside a fence for protection, with nothing else around it. 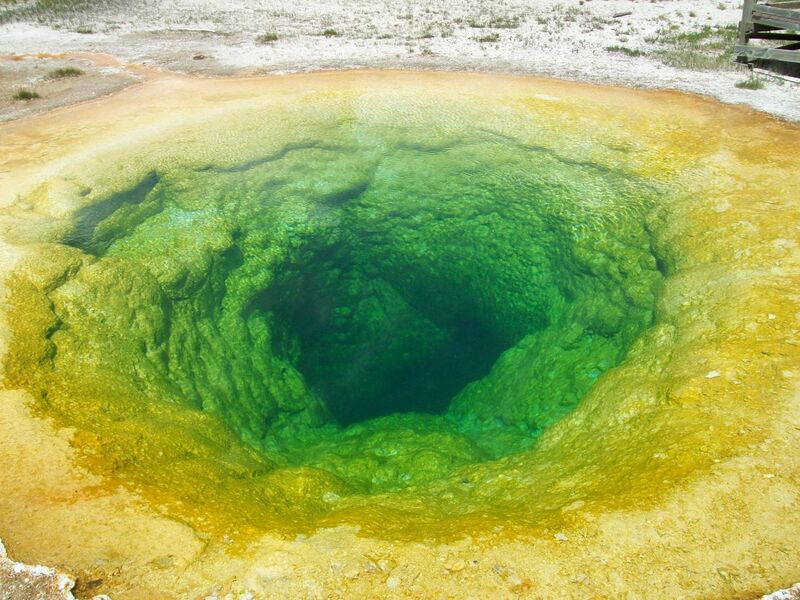 Based on our experience this is a place that can definitely be skipped at Yellowstone. 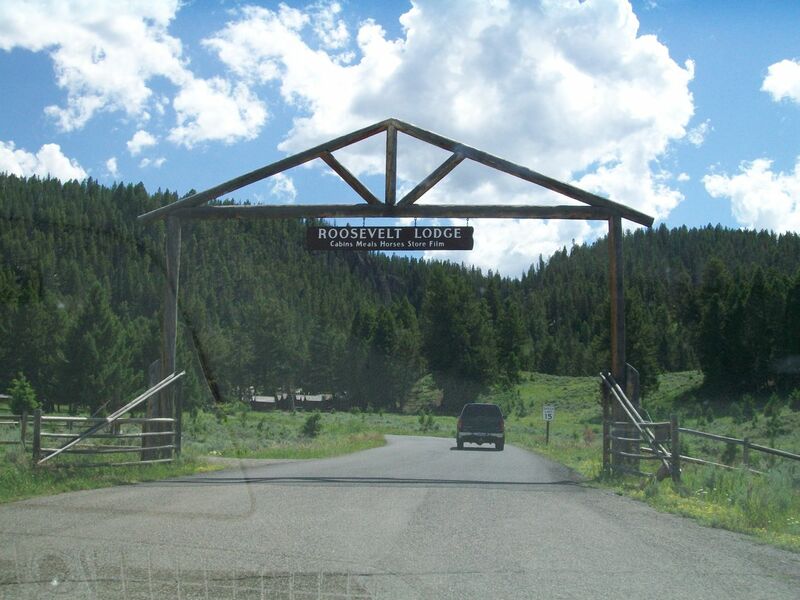 Roosevelt Lodge, on the other hand, was a lot more interesting. 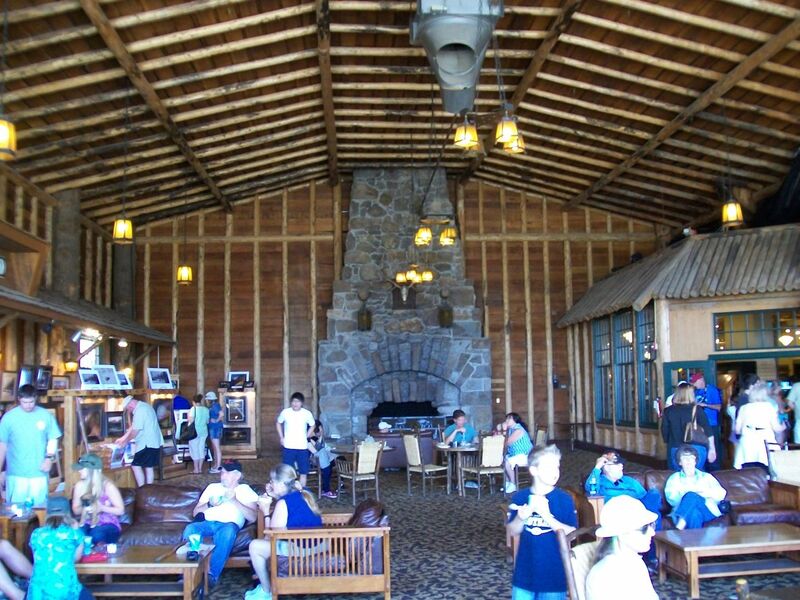 This is a place where visitors to the park can stay overnight, eat meals, and take part in various activities like hiking and horseback riding. We would have loved to stay here instead of outside the park in West Yellowstone, but accomodations at Roosevelt Lodge are strictly limited and the cost is very expensive. Everything here is built out of wood and had a rustic charm to it. We spotted a group of tourists going on a horseback ride and that would have been a fun activity to try too. We should have thought to make reservations for that ahead of time. 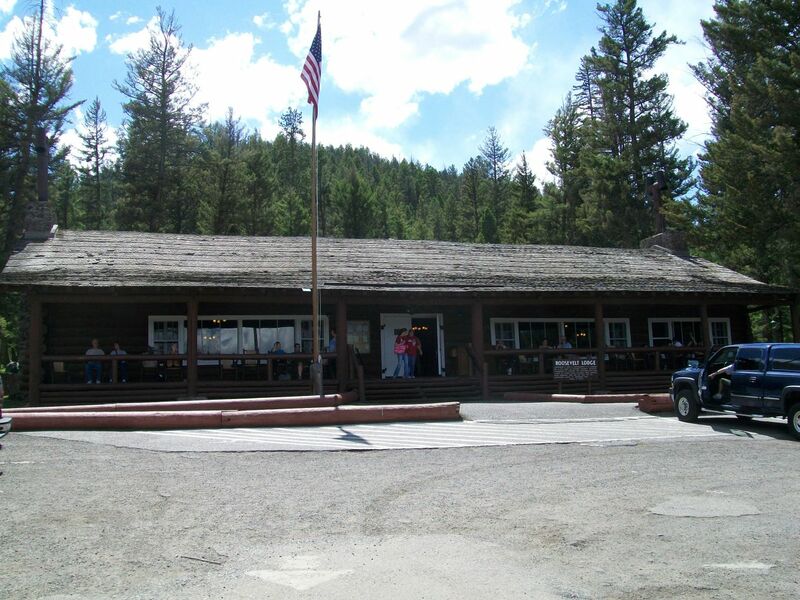 I think that we would have eaten lunch here if we hadn't recently stopped back at Fort Yellowstone for a meal. 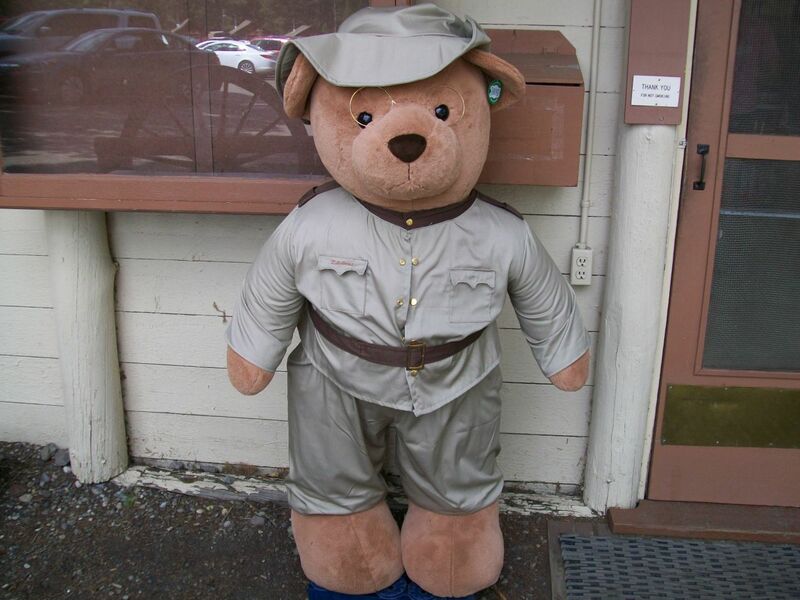 And yes, they had this completely adorable Teddy Roosevelt bear in National Park Service gear and pince-nez spectacles to greet visitors at the entrance. This place was a winner in my book. There's a waterfall near Roosevelt Lodge named Tower Fall (not Tower Falls apparently), and we drove the short distance to go check it out. 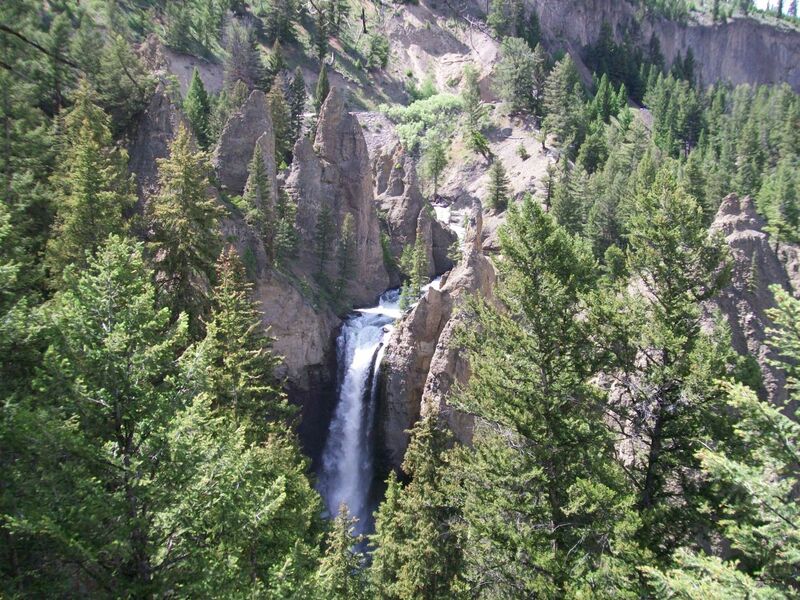 According to the signs here, a famous painting of this waterfall by Thomas Moran in 1871 helped persuade Congress to set aside Yellowstone as the world's first national park. The parking lot was located up above the falls and then there was a short hiking trail that led down the hill to the base of the water's flow. We went as a group along the hiking trail, only to find that the path leading on to the waterfall itself had been blocked off due to flooding having washed out part of the trail. However, we saw other tourists up ahead on the path, so my brother and I ignored the warnings and continued onwards. 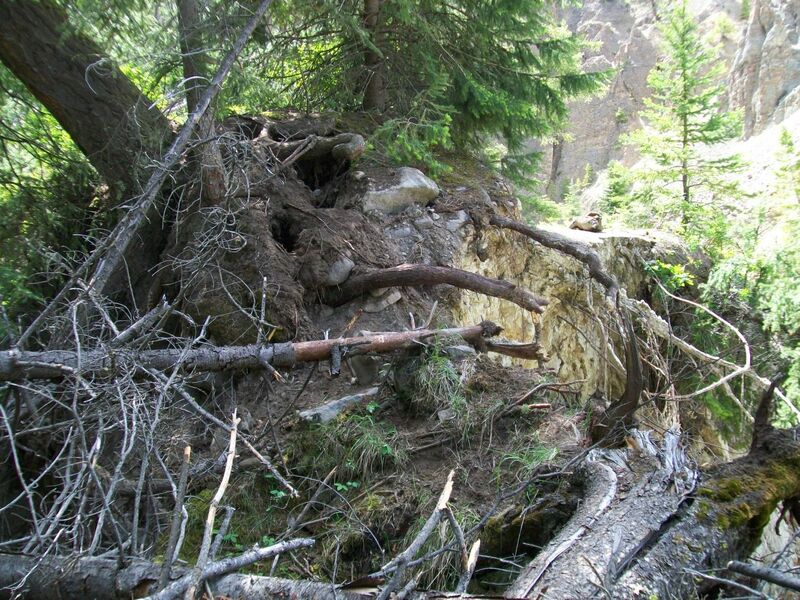 The trail was indeed in pretty terrible shape, and I included the second picture above showing where it had been completely eroded away. We scrambled across the exposed tree roots to the other side and managed to make it to the base of the falls. 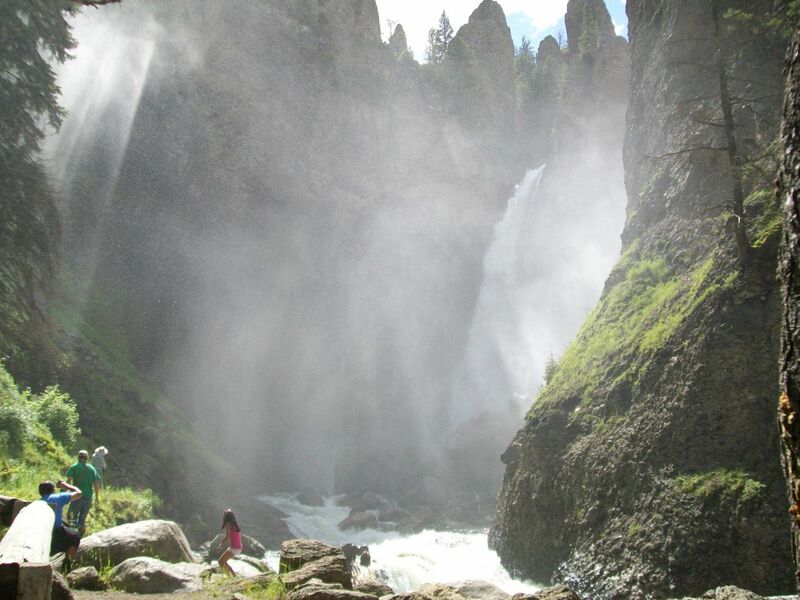 The sound of the water coursing onto the rocks below boomed here in this mostly enclosed area, and the waterfall kicked up enough spray that it was hard to see. It felt great after the tricky effort needed to reach this point, and we were glad that we had ventured onward to reach this point. It wouldn't be the last time on this trip that the two of us pushed onwards on a hike beyond what was probably reasonable. 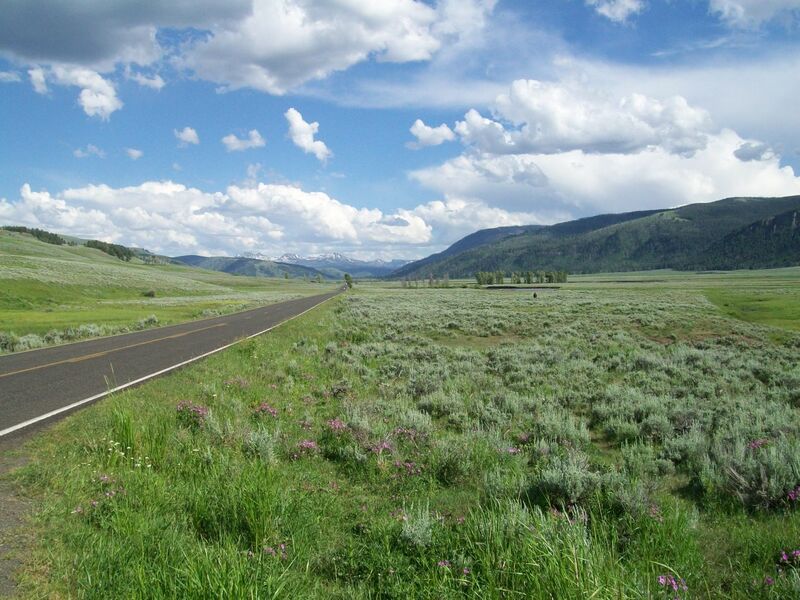 Our last destination for the day was the northeastern corner of Yellowstone Park, which hosts the area known as the Lamar Valley. 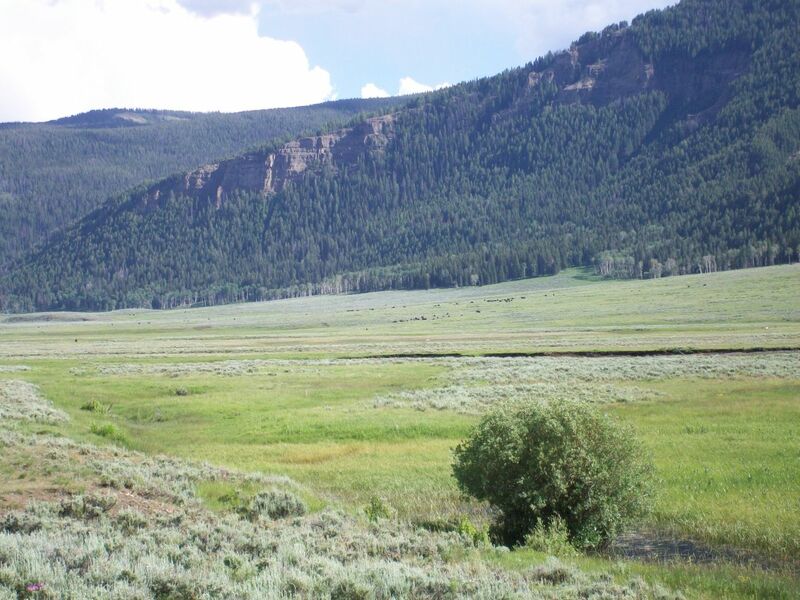 This is the most isolated part of the park accessible by road, and most of the tourists that come to visit Yellowstone never make it out this far away from the main visitor centers. The Lamar Valley may very well be the prettiest part of the whole park; instead of the canyons and hot springs and waterfalls that we had been seeing elsewhere, this particular area instead featured sweeping open plains with snow capped mountains in the distance. Off to our right, we could see a large herd of bison grazing on the grasses underfoot in the shadow of the forested hills beyond. Up above us, it felt like the sky went on forever out here on the plains. This place was gorgeous. 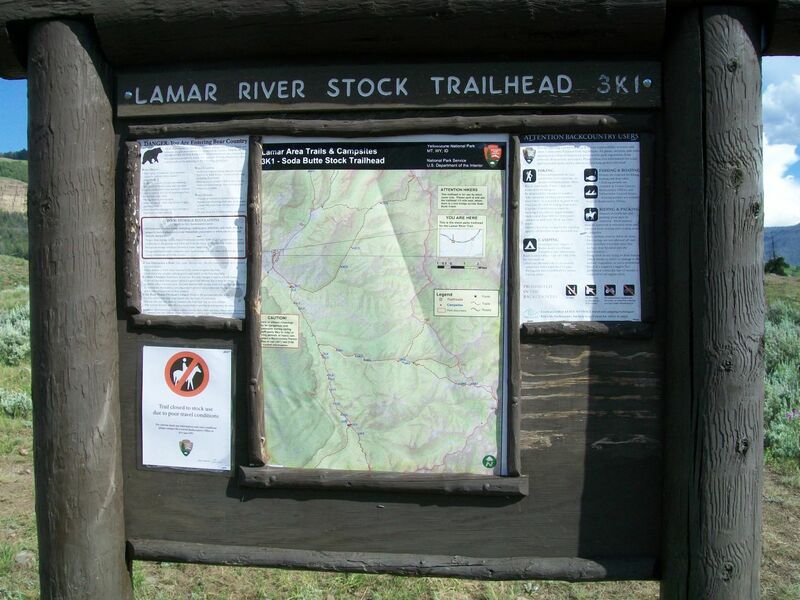 We spent about a half hour taking a brief hike out onto the Lamar River Trail. It was getting late in the afternoon and we still had a lengthy drive all the way back to West Yellowstone for the night, so we weren't able to go too far on this trip. 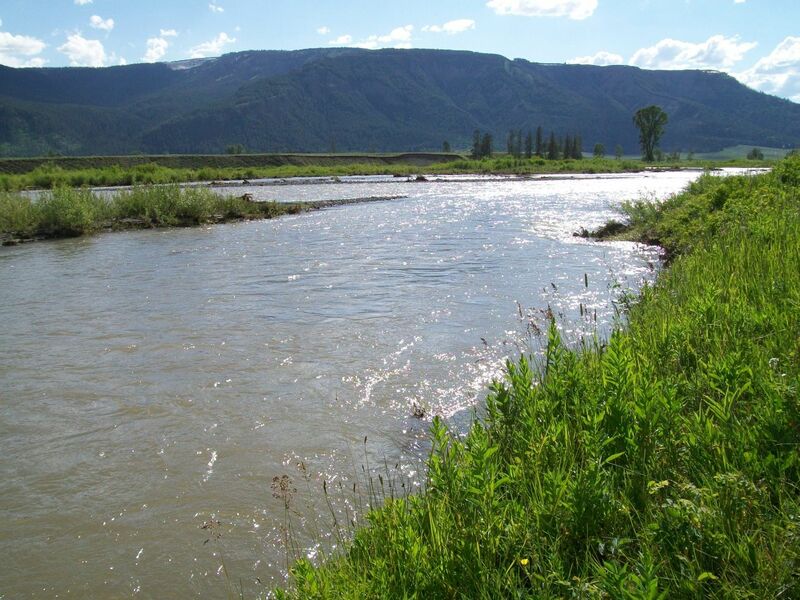 We limited ourselves to reaching the bending course of the Lamar River and then turned back rather than try to cross it. 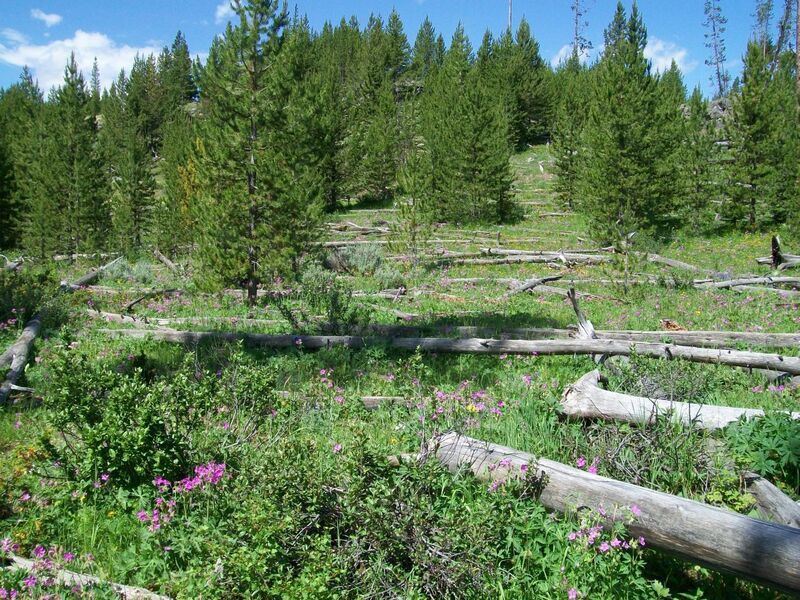 Even on this brief hike the weather was spectacular, the landscape a beautiful tableau of unspoiled wilderness. 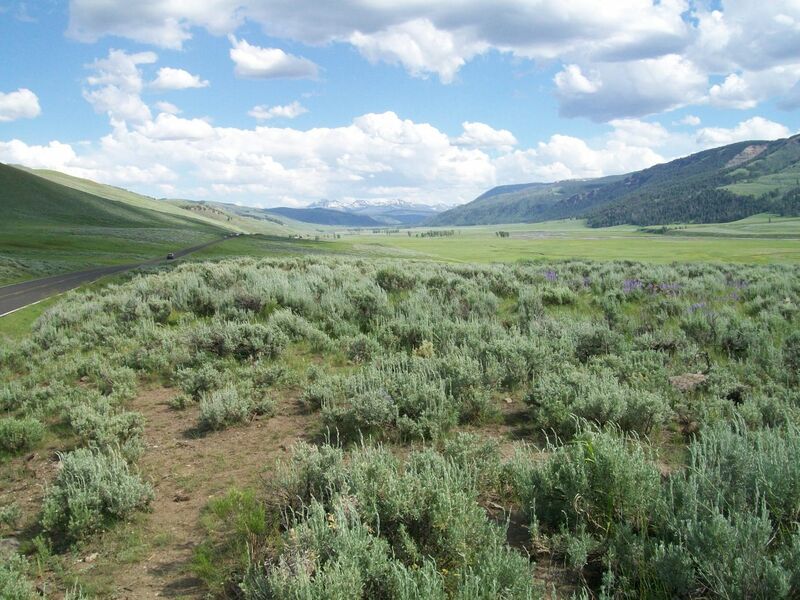 I would love to come back here one day and go on a camping trip deep into the backcountry of the Lamar Valley. 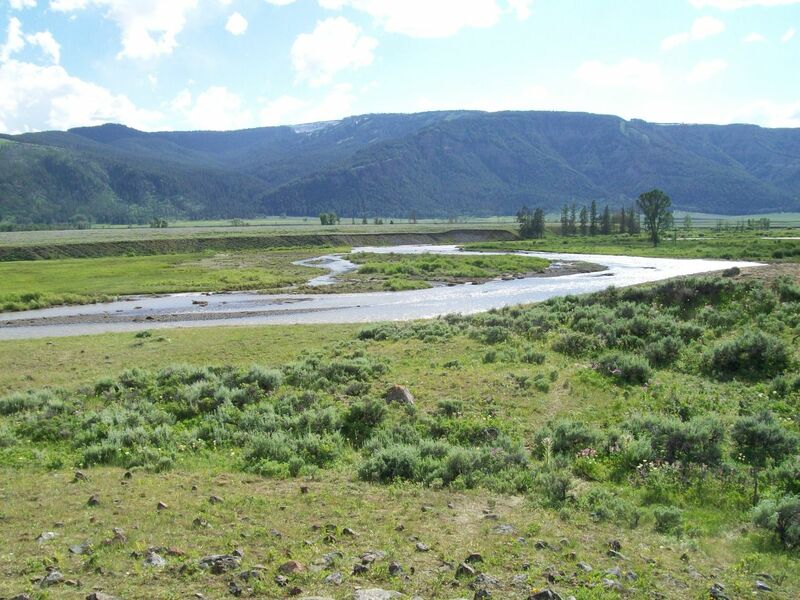 There are hiking trails that follow the course of the river for dozens of miles on end, and Yellowstone is enormous enough that it's easy to spend weeks or even months hiking without ever doing the same trip twice. If I ever did something like that, I would definitely make sure to bring some bear spray though. There are stories every year of tourists getting attacked by bears, and going deep into the backcountry is one of the best ways to run into them. The next morning we prepared to leave West Yellowstone for the last time, as we would be passing through the park one more time en route to the Grand Tetons located to the south. We came across one oddity that I had to photograph before we left: an actual Kentucky Fried Chicken restaurant?! The reason why this was strange was due to corporate branding; the Kentucky Fried Chicken chain had officially changed their name to "KFC" in 1991 because they didn't want to be associated with the word "fried" in their name any longer. And yet here was this one store two decades later in 2011 still using the Kentucky Fried Chicken name and even the old cartoon version of Colonel Sanders with the cowboy hat. Now to be fair it did look like the store was closed, but this was still a surprise, much like when I discovered that Blockbuster Video was still alive and well in Alaska in 2015. It was like stumbling across an old preserved storebox that was left frozen in time as the rest of the world moved on. None of the geysers here were particularly large, but they were far from quiet as they gushed hot water up into the air at regular intervals. 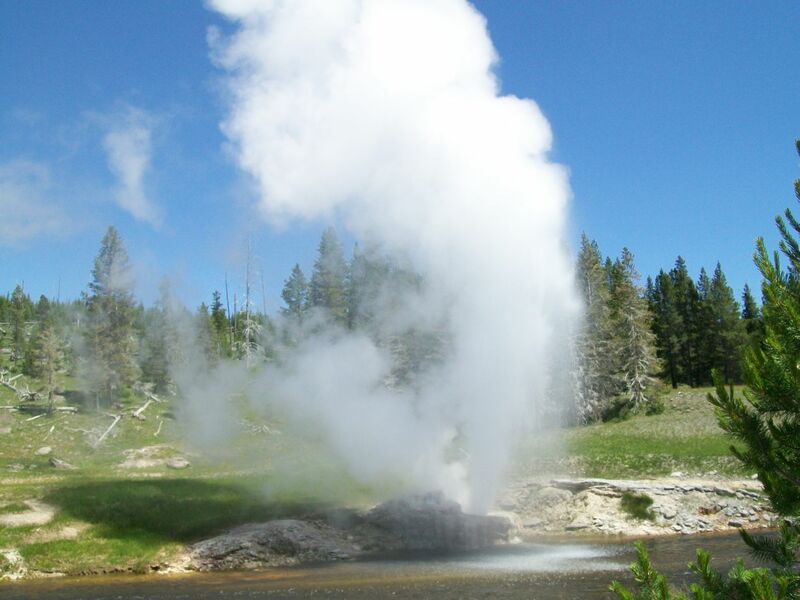 The steam produced by the geysers was the most visible component of their eruptions, with clouds of white smoke billowing upwards long after the water had subsided. The effect was inspiring even here on a warm summer day; I can only imagine what it would be like in winter when the temperature would be well below freezing. It was also noticeably more crowded here than it had been out in the northeastern sections of the park during the previous day. 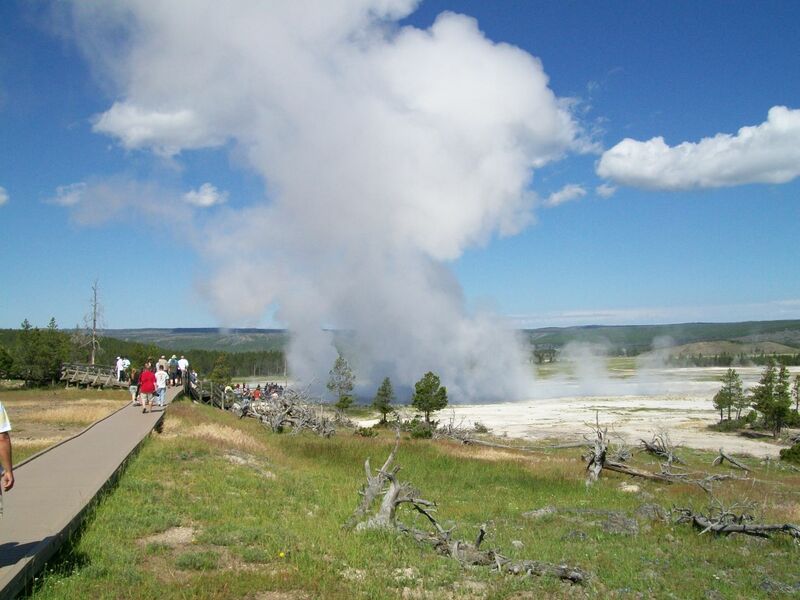 This section of the park that runs past Old Faithful is generally the busiest area in Yellowstone, with far more bus tours passing through here as compared to the northern parts. 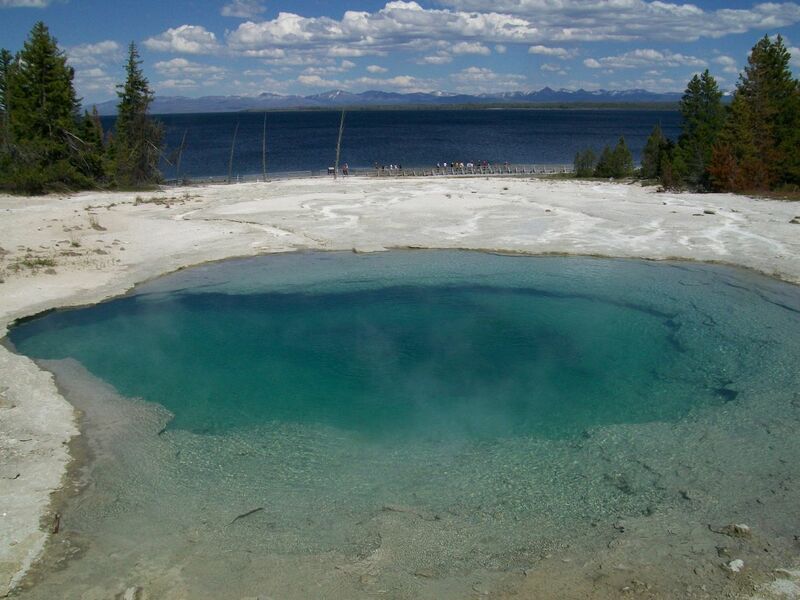 A little bit further down the road was the Midway Geyser Basin with its own hot spring pools. The featured attraction here was the Grand Prismatic Spring, which lay at the end of another half mile walking path raised up on boards. This path started out by crossing a bridge over a beautiful mountain stream of clear dark blue water. Runoff from the hot springs was entering into that river and I was entranced by the mixture of the steaming orange-colored hot springs liquid together with the flowing stream. Further ahead on the walking path was the Turquoise Pool, with the name obviously coming from the bright blue color of the water. It looked a little bit like the water that might be seen on a tropical beach somewhere, except of course for being scalding hot to the touch. I was tempted to reach out with my fingers but the signs warning of 160 degrees (Fahrenheit) temperatures were enough to squash that thought. 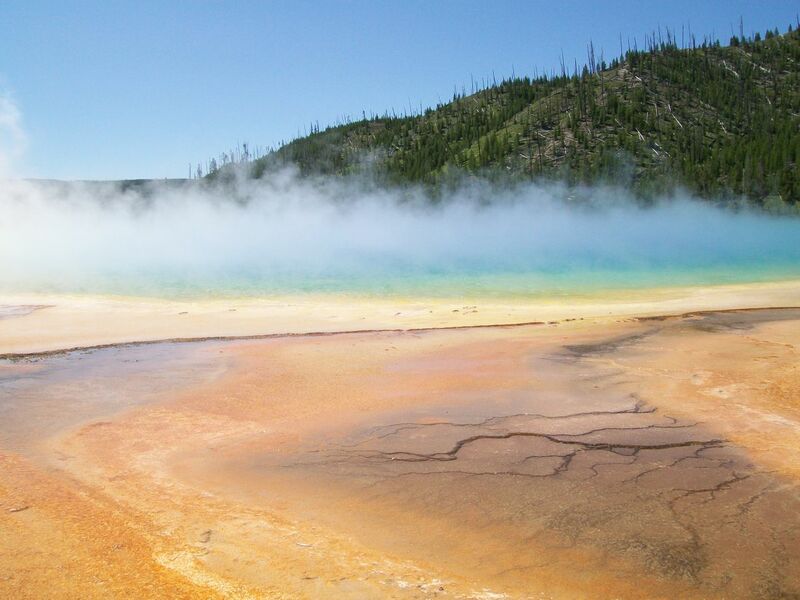 The Grand Prismatic Spring is an underappreciated natural wonder that the park can boast of holding. 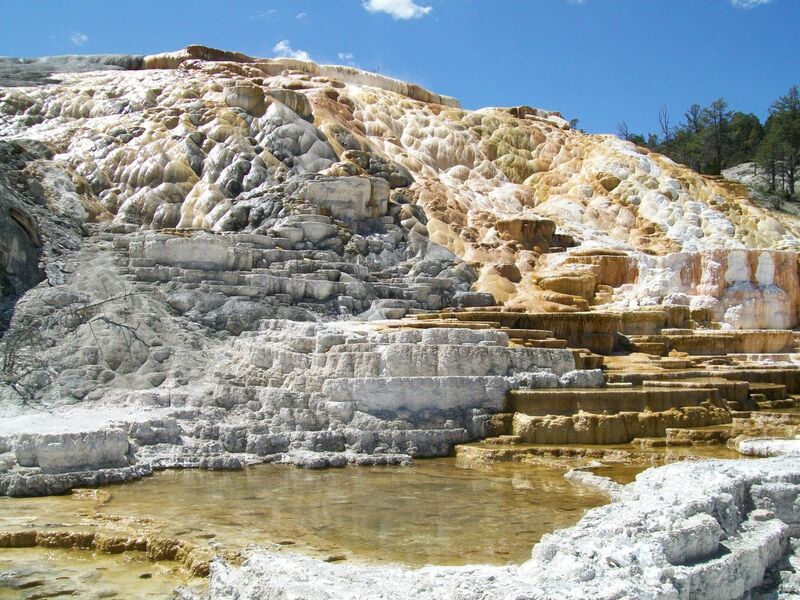 This is the largest hot spring in the United States and the third largest in the world according to Wikipedia, with a size of roughly 300 feet / 90 meters from side to side. If you can imagine a hot springs pool of boiling water roughly the size of an American football field, that's what this looks like. 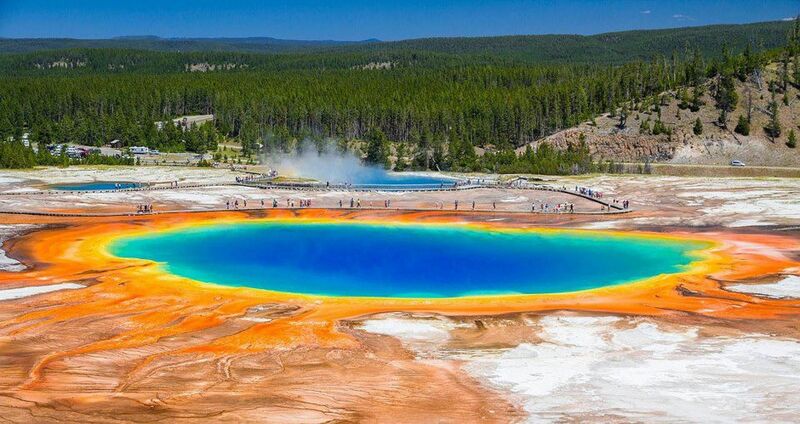 The Grand Prismatic Spring is particularly known for its brilliant array of colors, with blue predominating but running through shades of green, yellow, orange, and red along the outer edges. 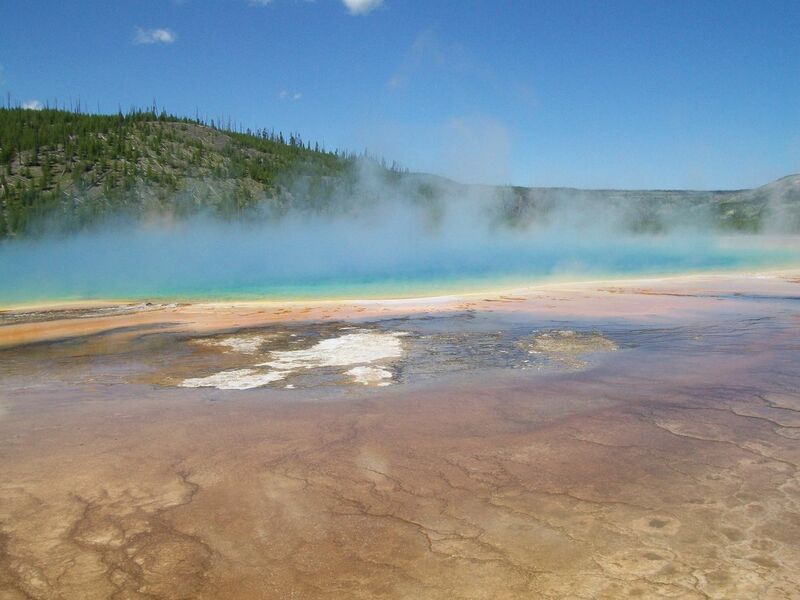 Since visiting I've seen pictures of the Grand Prismatic Spring pop up a number of times in stock image searches, displayed on the Windows startup screen and places like that. I was disappointed with how my pictures came out because the steam from the pool obscured most of the view. The images above were the best that I took and they aren't especially good. 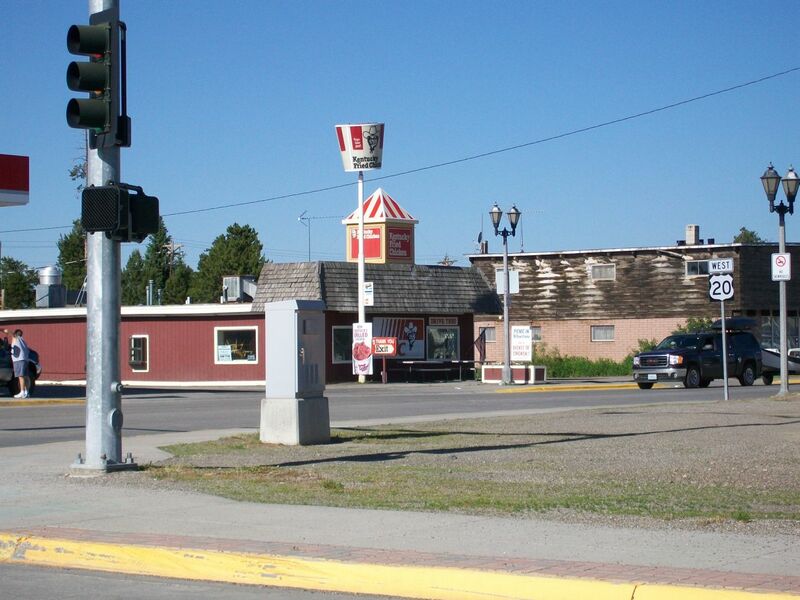 Here's an Internet picture doing a better job of conveying what this place looks like. 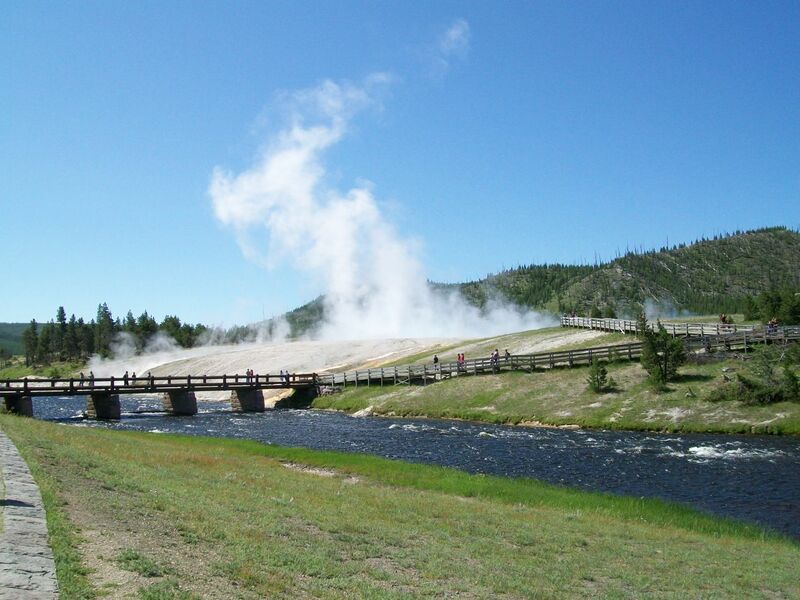 It's an awesome sight to see and one of the highlights of visiting Yellowstone. 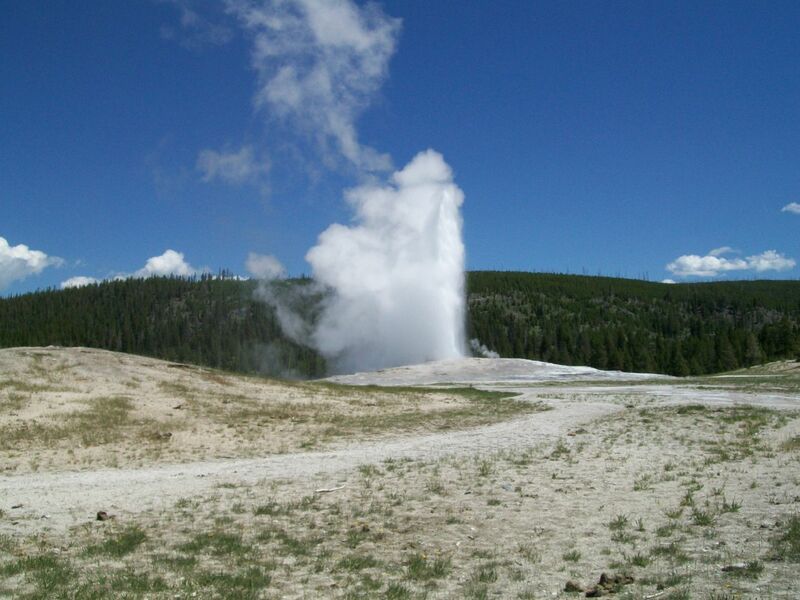 Then it was time to visit the most famous natural wonder in Yellowstone National Park, Old Faithful itself. 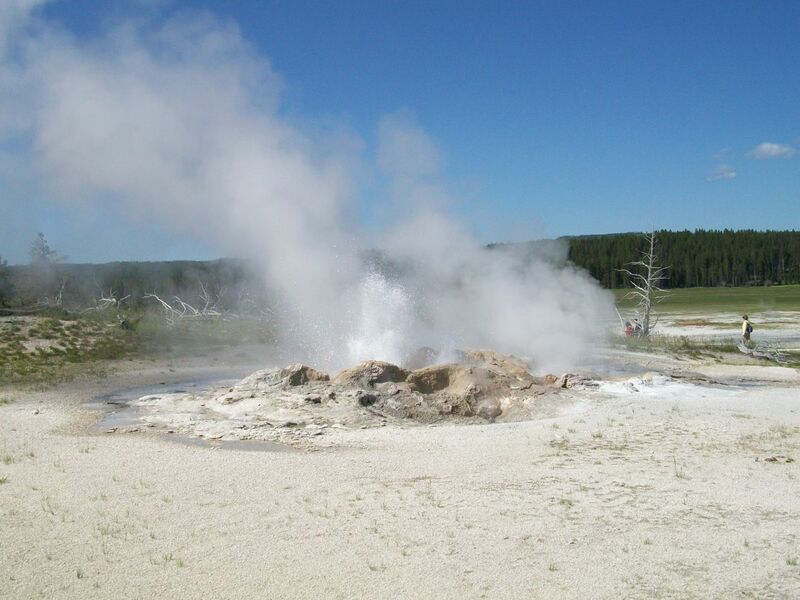 The geyser is known around the world for its regular pattern of eruptions, blowing its top every 60 to 90 minutes on a highly predictable schedule. The park rangers can tell how long it will be until the next blast with very high accuracy based on the duration of the previous eruption. 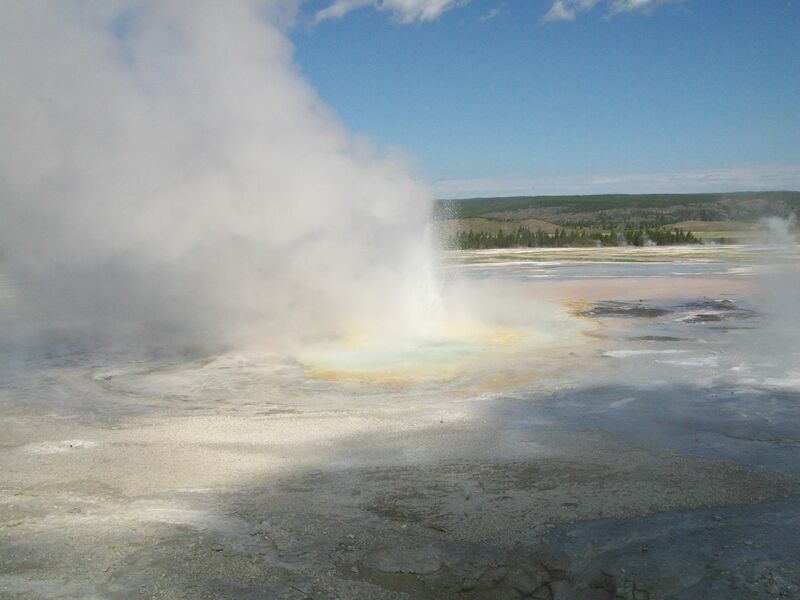 The world's most famous geyser shoots water to an average height of about 150 feet / 45 meters and eruptions last from 2 to 5 minutes in duration. 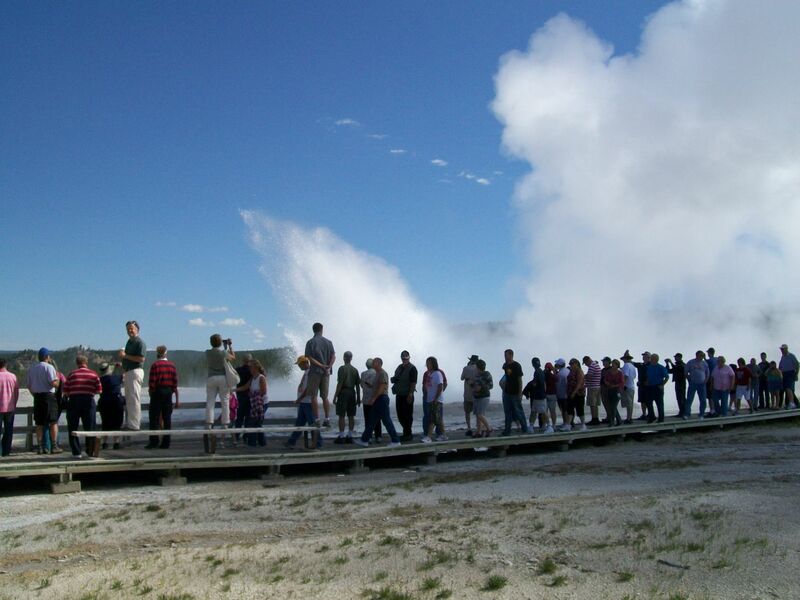 There are pictures of Old Faithful erupting as far back as the 1870s and tourists have been coming to Yellowstone ever since to see the geyser in action. 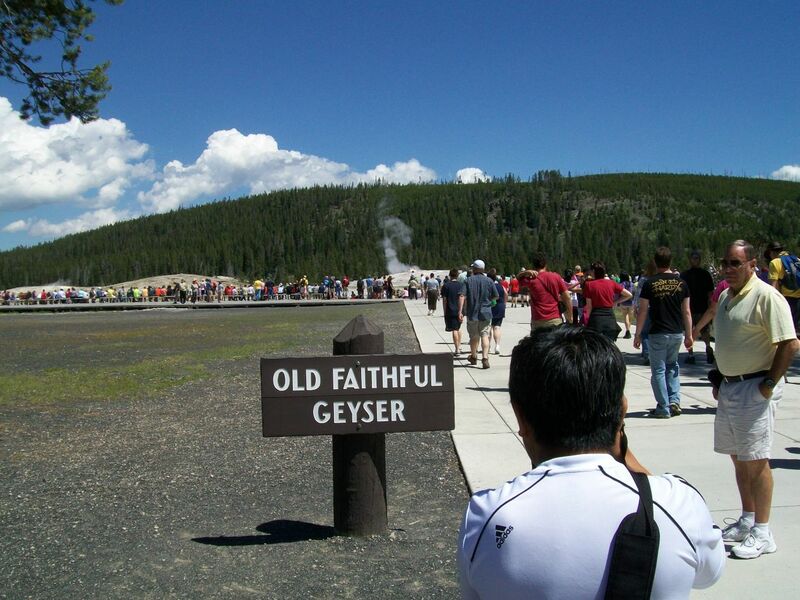 Visitors should be aware that the Old Faithful area is by far the most crowded part of the park, and there are tour buses that come through and stop only here and nowhere else. That's a sad wasted opportunity on their part but travelers need to plan around this. We were fortunate enough to arrive about ten minutes before Old Faithful was scheduled to erupt, and we hurried over to pick out a spot in the viewing area right away. The stands ringing around the geyser were packed, and I'd estimate that there were roughly a thousand people gathered together to watch the event. Given that most of the other parts of the park had rarely had more than a couple dozen visitors present at one time, this was quite the contrast. We didn't have long to wait: Old Faithful went off right on schedule and we were treated to about three minutes of water cascading into the air. 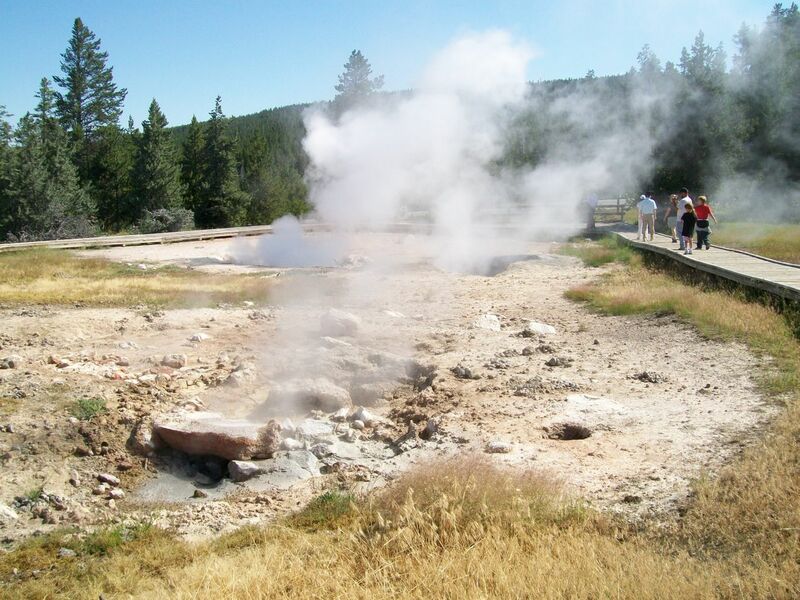 It emerges at boiling temperatures in a cloud of hot steam, and the park services maintains a wide space around the geyser to keep the visitors safe. 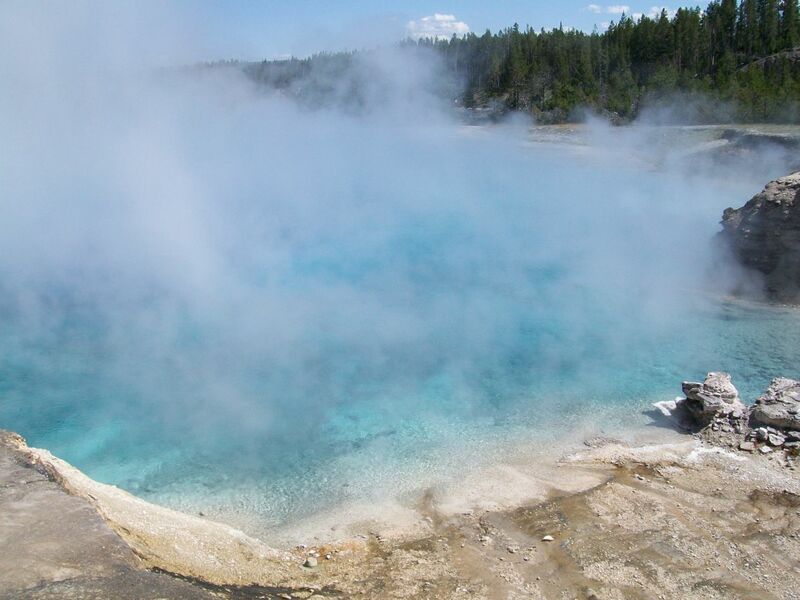 We were the recipients of great timing here to see Old Faithful right away, and now we could explore the rest of the Upper Geyser Basin without a need to return at a specific time. The familiar walking trails ran through this section of the park as well, only they extended much further back into the distance here in the Old Faithful vicinity. We were able to go on more of a proper hike here instead of a quick stroll in a circle. 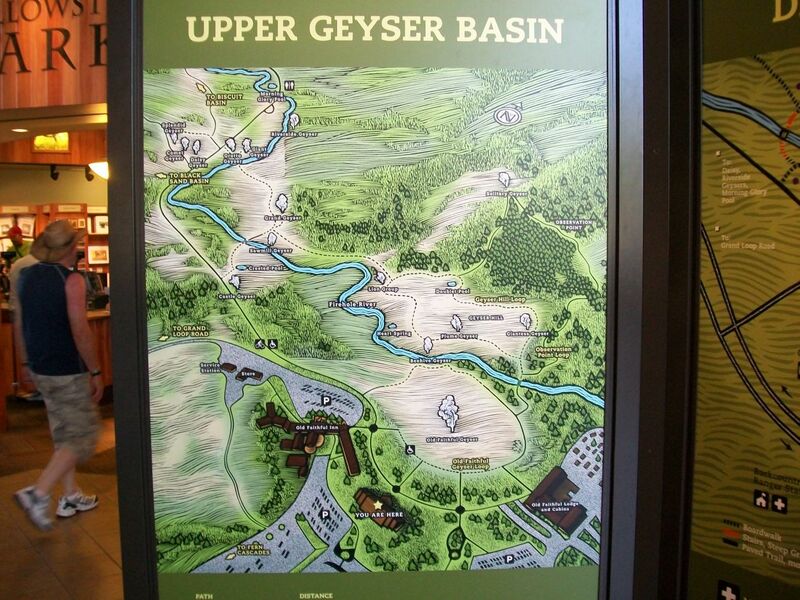 One thing I hadn't expected before visiting Yellowstone was the number of other geysers present in this area. There were about a dozen in total, and while none of them were as famous or reliable as Old Faithful, some of them were larger in size. 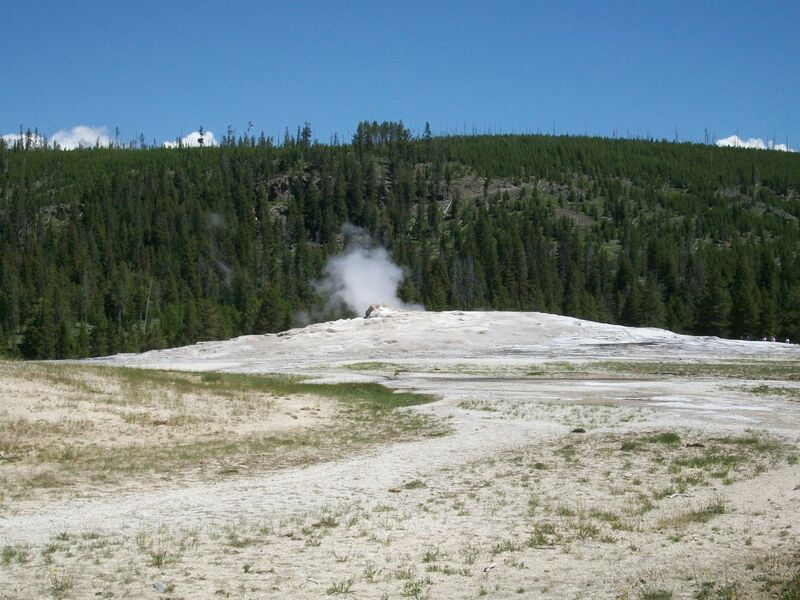 One of the pictures above displays the inactive cone of the Giant Geyser, which has tossed water as high as 300 feet / 90 meters in the past. 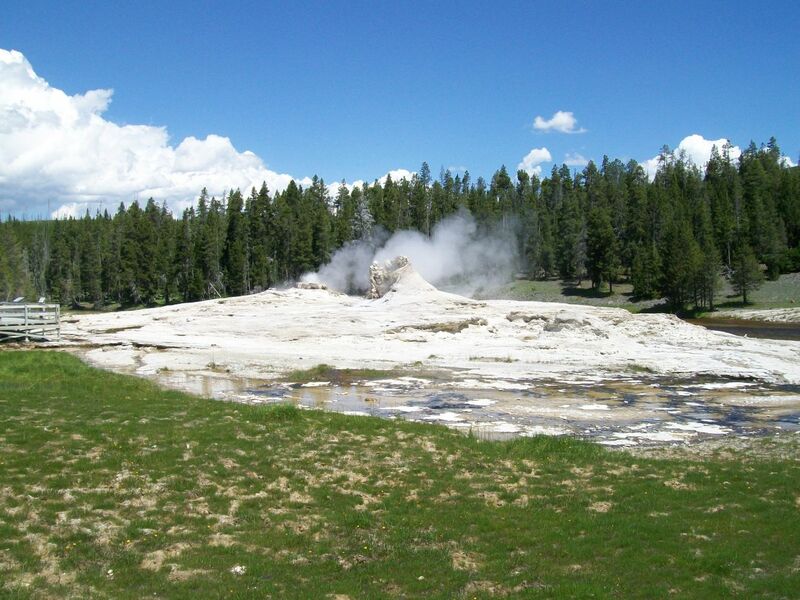 Unlike Old Faithful, the eruptions from this geyser can also last for more than an hour. It doesn't erupt very often though, and we had no chance of seeing it in action on this day. Further ahead was Morning Glory Pool, a much smaller version of a hot spring along the lines of the Grand Prismatic Pool. This pool had a green tint to it, which was unfortunately due to idiots throwing things like coins into it and discoloring the water. No matter how many signs get posted around the park, people still do stupid things like that. 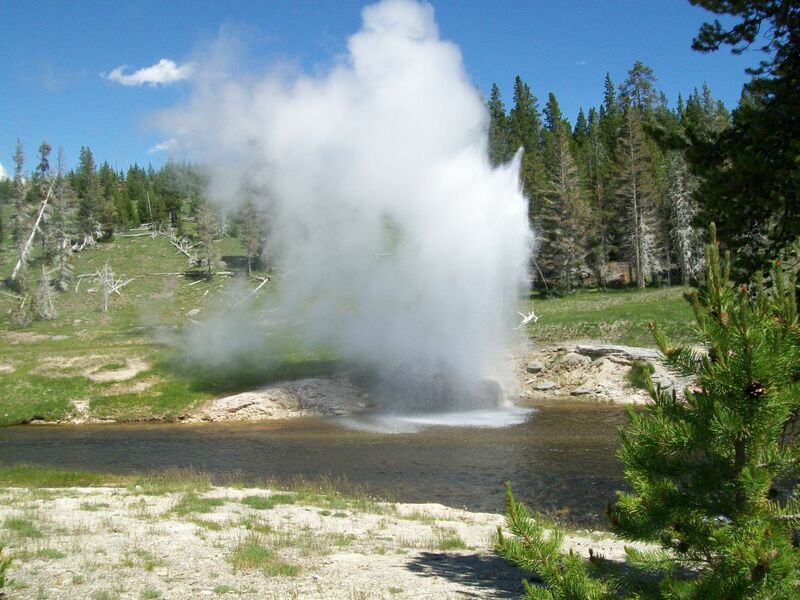 We had the good luck to catch another geyser in action at the tail end of our hike. This was the Riverside Geyser, much smaller than Old Faithful but equally predictable with eruptions going off about once every six hours. Given that lengthy timeframe between eruptions, we had truly stumbled into the right moment to be passing by this spot. 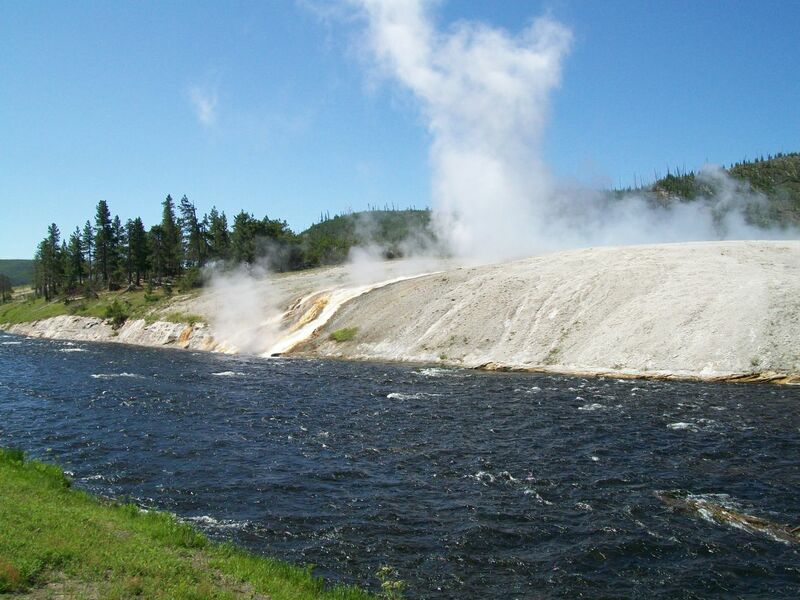 The Riverside Geyser has a long eruption time of about 20 minutes, and its location next to the, well, river made it distinct from the landbound Old Faithful viewing area. If you looked closely, it was even possible to see a rainbow in the water particles thrown up into the air. 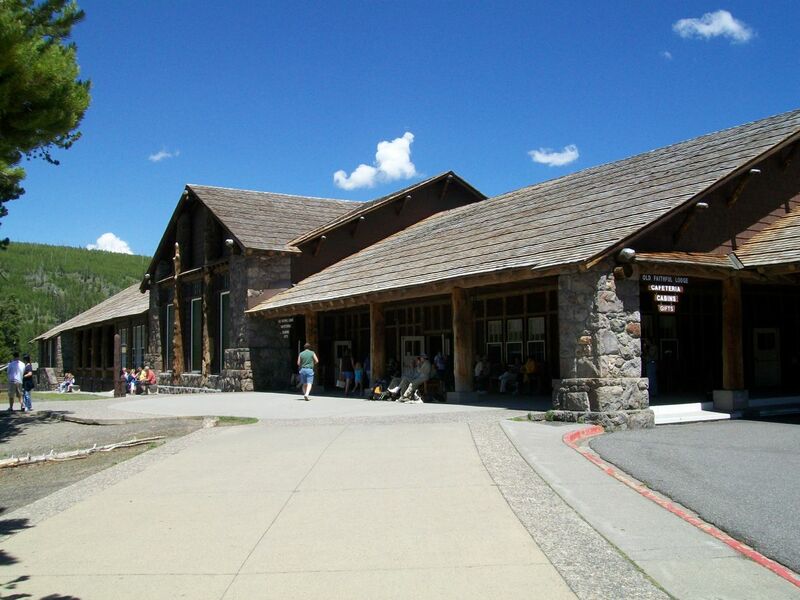 At the tail end of our hike, we finally entered the visitor center for the first time and had a chance to eat lunch in the cafeteria area. 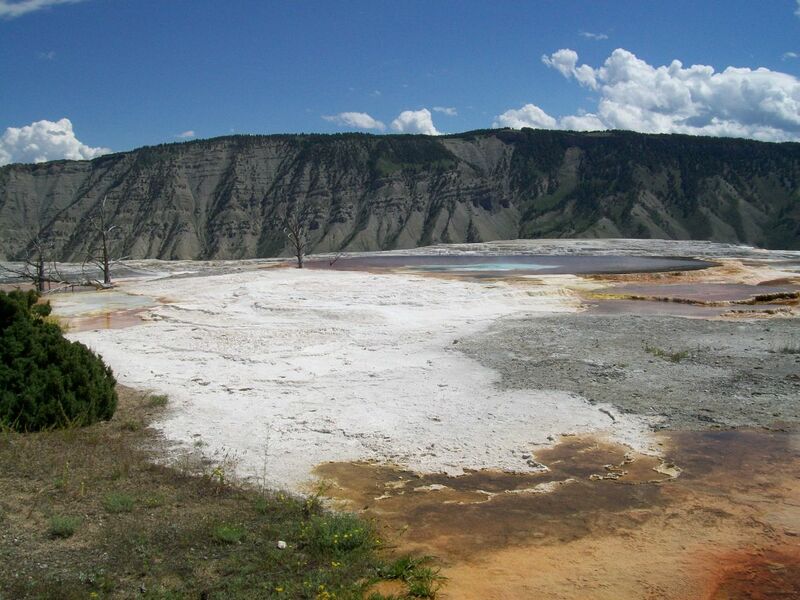 There's a small museum here that discusses the geothermal activity underpinning the geysers and does its best to terrify visitors by discussing the supervolcano laying underneath Yellowstone. 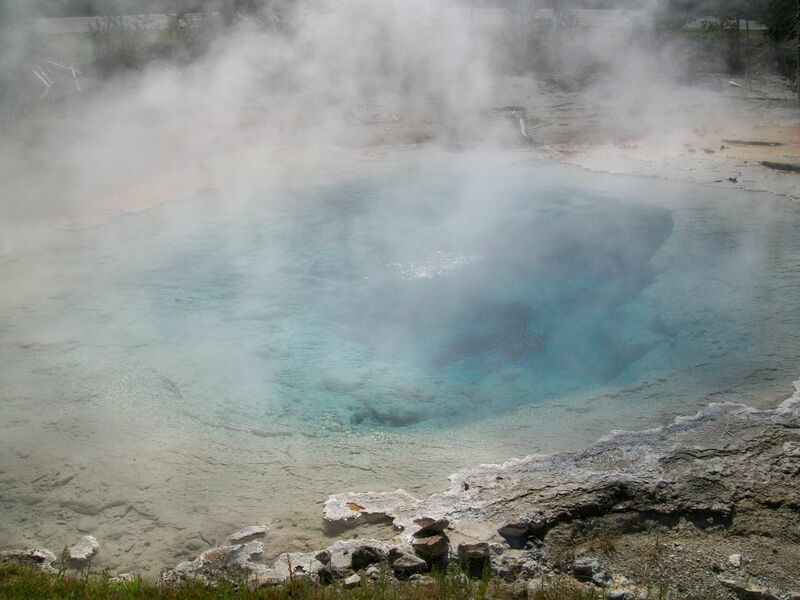 Even though the thing last erupted some 600,000 years ago, it's not something that you want to be reading about while standing INSIDE the volcano's caldera. 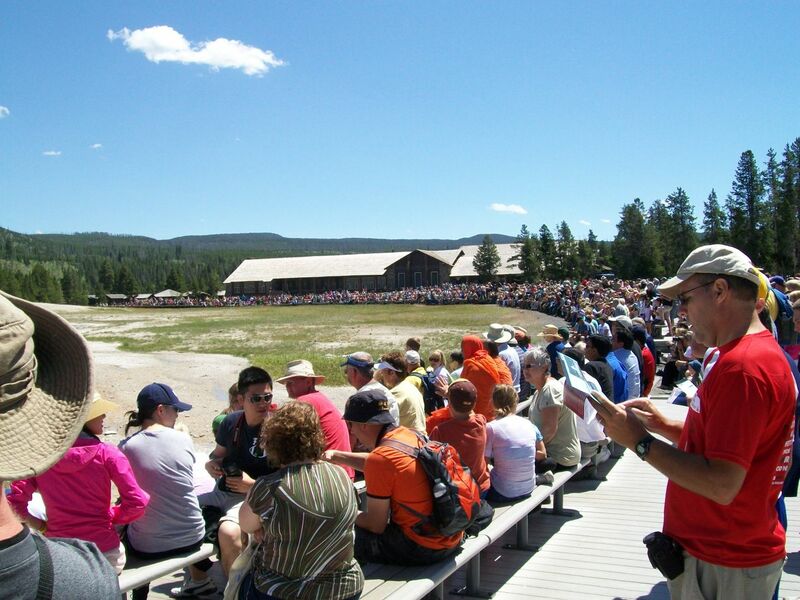 After leaving the Old Faithful site, we turned to the south and began heading towards the exit out of the park. 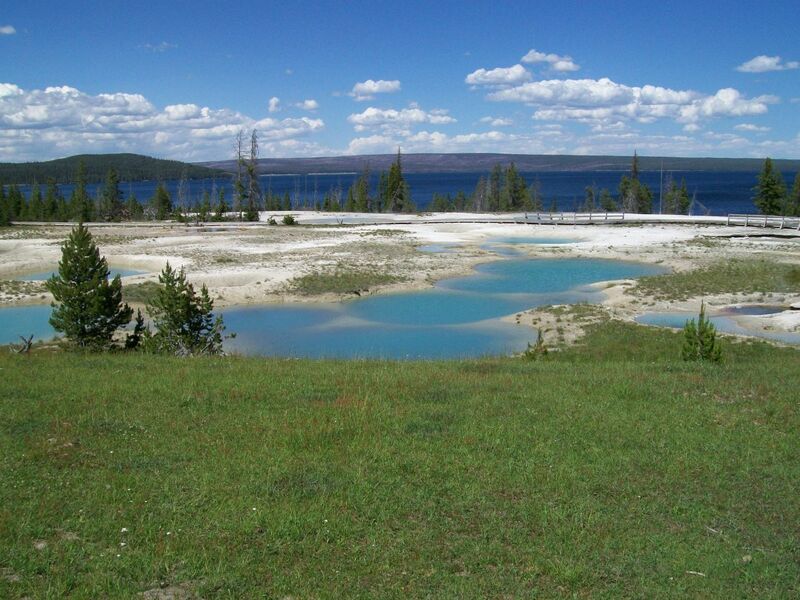 There was one more stop to make along the way, this one a quick look around the West Thumb Geyser Basin. 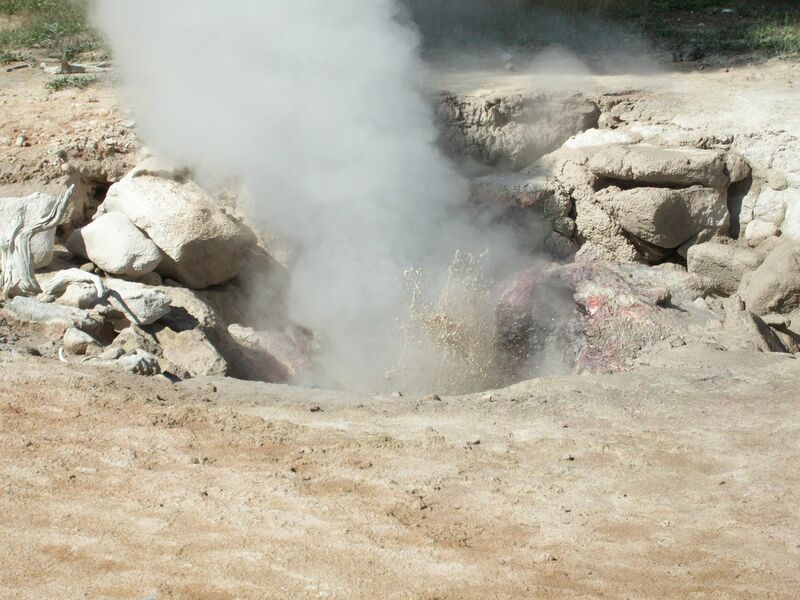 By now we were almost starting to get tired of seeing hot springs and geysers after having visited so many. The West Thumb location was unique by sitting next to Yellowstone Lake at the southwestern corner of the water's edge. 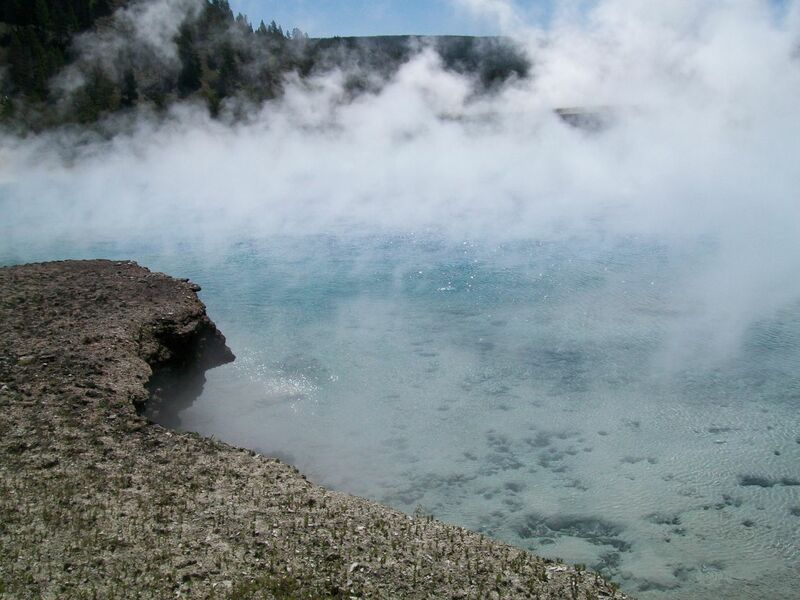 The sky blue of the hot springs provided a complimentary color to the darker blue of the lake's waters. We did the usual walk around the short circular path around the West Thumb basin without spending too much time here. We expected that that would be it for Yellowstone only to find that there were still more wildlife sightings before we exited the park. First there was a deer nearby at the edge of the forest in some new growth evergreens, then we saw a canine of some kind crossing the road as we left the parking lot. Based on the size of the animal I think that this was a coyote although it could have been a small wolf. There are plenty of both coyotes and wolves within the park's boundaries and either wouldn't be out of the ordinary. Since this animal looked distinctly smaller than the wolf that we saw earlier, I'm going to maintain that this was a coyote until someone more knowledgable about zoology tells me otherwise. 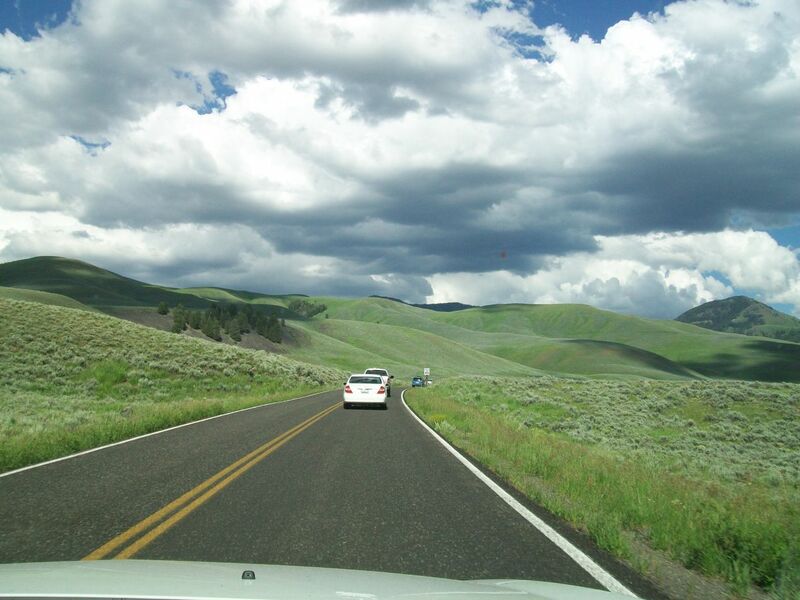 And with that, we finally did leave Yellowstone National Park via the south entrance. It was a magnificent three days spent within the park with a lifetime's worth of wildlife sightings. 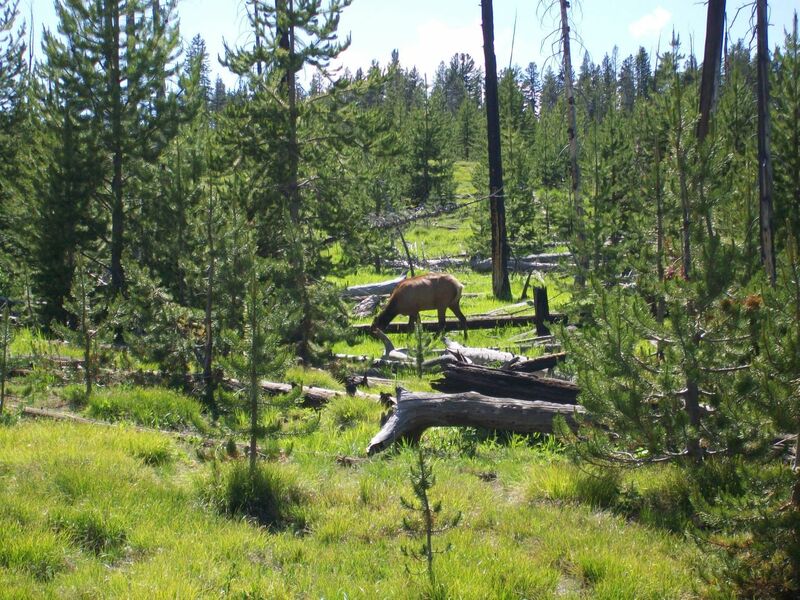 Quite aside from the beauty of the natural landscape, with the canyons and the geyseys and the hot springs, we had also managed to see bison, deer, elk, a wolf, a bald eagle, a bear, and a coyote. The only creatures that we had missed were grizzly bears and mountain lions, and we could live with not seeing those animals up close and in person. Yellowstone holds a special place in the American imagination and it deserves its esteemed place as the world's first ever protected national park. Anyone who enjoys the great outdoors should try to make it here at least once in their lifetime. 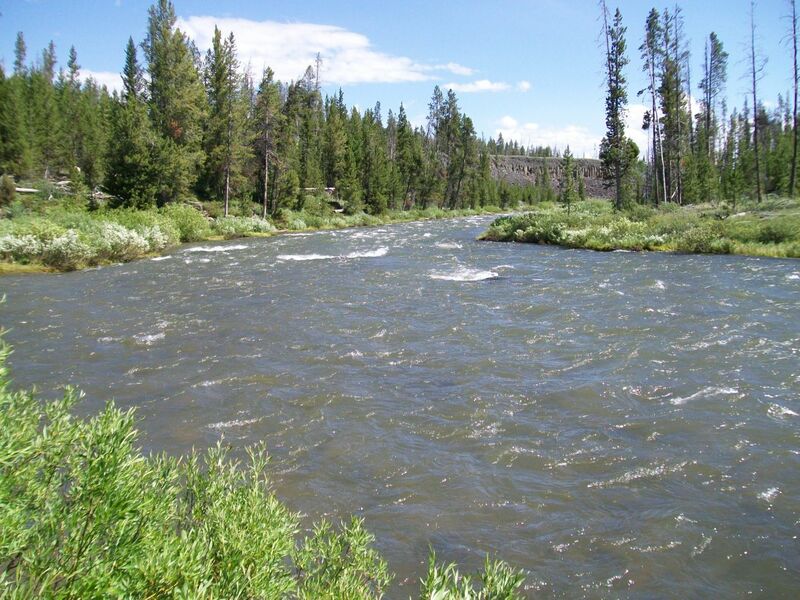 We were moving on now to the Grand Tetons with many new memories of our time spent in Yellowstone.